NOTE: In this report, when the text refers to an event (e.g., a marriage) for which an associated document is available, a link will be provided to that document. If you see a word or words in underlined blue text, just double click on it to see the document. To return to the main report, simply click the back arrow (usually in the upper left of your computer screen). 1. Daughter Petra Marta Chavarría was baptized August 1, 1836 in San Pablo, Meoqui. 2. Daughter Maria Longina de los Dolores Chavarría was baptized March 15, 1838 in San Pablo, Meoqui. 3. Son Jose Longinos Chavarría was baptized March 19, 1840 in San Pablo, Meoqui. 4. Son Romaldo Chavarría was baptized February 14, 1847 in San Pablo, Meoqui. See below for additional information. 5. Son Mónico Chavarría was baptized May 7, 1849 in San Pablo, Meoqui. 6. Son Severiano Chavarría was born in Meoqui circa 1853. See below for additional details. 7. Daughter Micaela Chavarría was baptized May 13, 1854 in San Pablo, Meoqui. The only children of the seven known to have immigrated to the United States were Romaldo and Severiano. A. Son Alberto Hernandez was born July 12, 1907. He was baptized in Terlingua September 15, 1907 by Father Brocardus. His godparents were Ruperto Chavarria and his wife, Angela Galindo. In 1920 he was living with his parents in the Fort Stockton area. He died of pulmonary tuberculosis in Fort Stockton June 30, 1932 and is buried in the Catholic Cemetery in Fort Stockton. B. Daughter Ignacia Hernandez was born in 1908 and in 1920 was living with her parents in the Fort Stockton area. 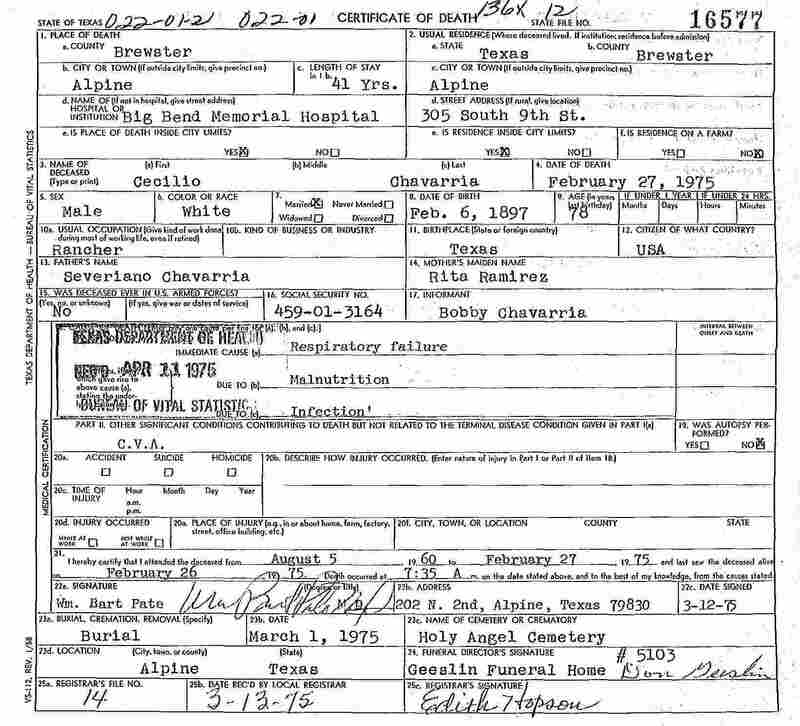 C. Daughter Serapia Hernandez was born November 14, 1909 (a). She was baptized by Father Brocardus in Terlingua April 24, 1910. Her godparents were Ruperto Chavarria and his wife Angela Galindo. She died of diphtheria in Fort Stockton August 25, 1920 and was buried in the Catholic Cemetery the same day. A. Daughter Facunda Quintela was born November 27, 1900. She was baptized in Terlingua May 20, 1900 by Father Brocardus. Her godparents were Carlos Acosta and his wife, Pascuala Ramirez. B. Son Martin Quintela was born in Terlingua January 30, 1903. (1) Son Jesus Quintela was born in Fort Stockton December 25, 1940. (2) Son Avel Quintela was born in Fort Stockton February 5, 1943. (3) Son Julio Quintela, Jr. was born in Fort Stockton June 19, 1944. (4) Son Anecleto Quintela was born in Fort Stockton July 13, 1946. D. Daughter Josefa Quintela, twin of Maria, was born July 11, 1907. She was baptized in Terlingua September 18, 1907 by Father Brocardus. Her godparents were Ponciano Porras and Natividad Gomez. 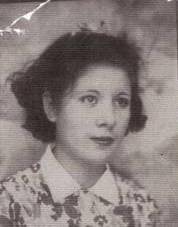 E. Daughter Maria Quintela, twin of Josefa, was born July 11, 1907. She was baptized in Terlingua September 18, 1907 by Father Brocardus. Her godparents were Ponciano Porras and Natividad Gomez. F. Son Inocente Quintela was born December 28, 1909. He was baptized in Terlingua April 24, 1910 by Father Brocardus. His godparents were Sebastion Acosta and Marcelina Tercero. 3. Daughter Eulalia Chavarria was born in Fort Stockton in 1880. 4. 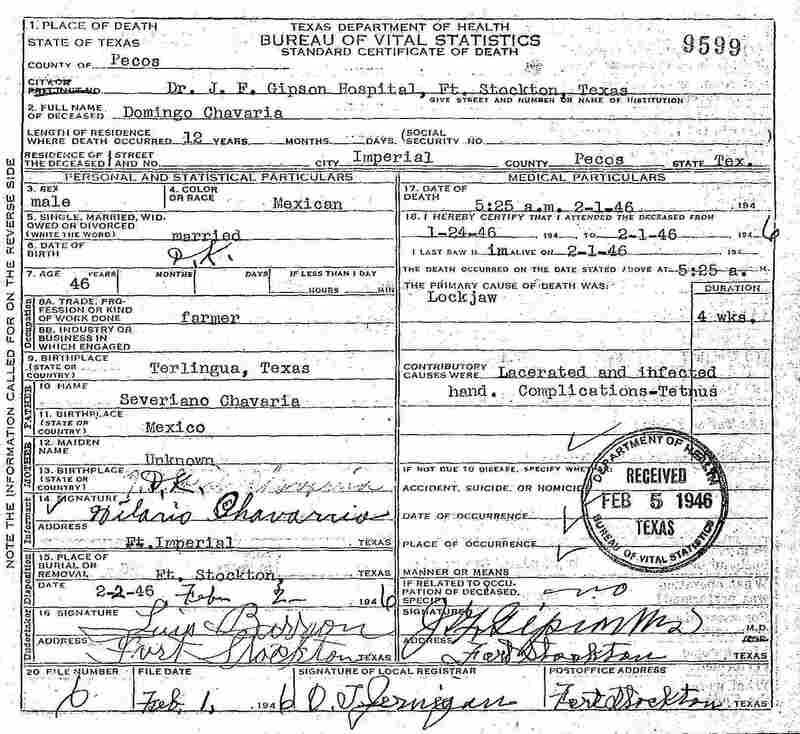 Son Guadalupe Chavarria was born December 12, 1895. He lived in Fort Stockton most of his life. He died of a stroke in Memorial Hospital, Fort Stockton on December 5, 1974 and is buried in St. Joseph’s Catholic Cemetery. Severiano Chavarria was born in 1853 in Meoqui, Chihuahua, Mexico. The date of his immigration to the United States in not known, but by 1876 he was living in Fort Stockton. He married Rita Ramirez there February 7, 1876. 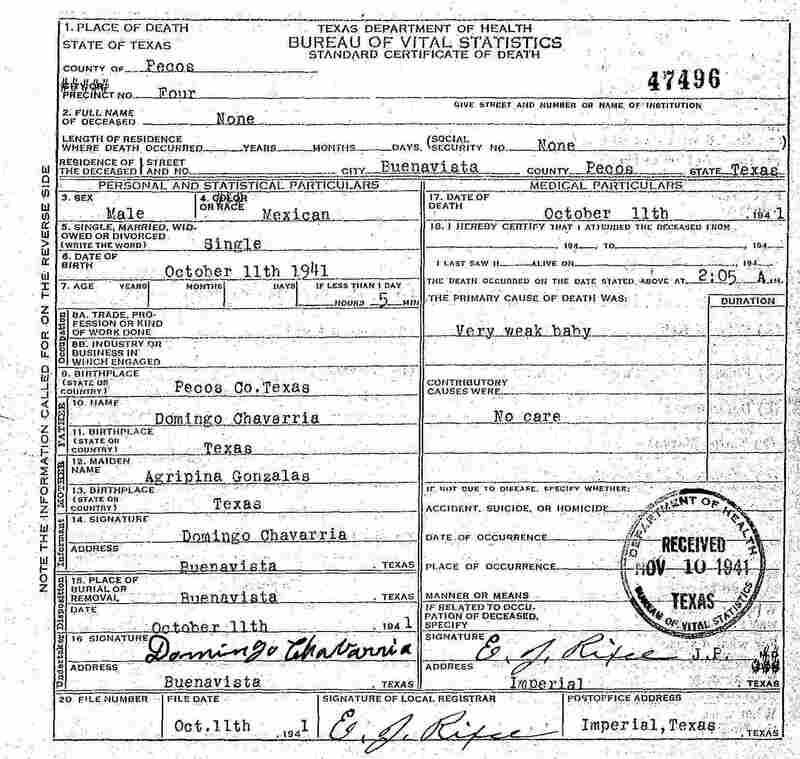 She was born in Presidio County probably in Fort Stockton circa 1861, the daughter of Luis Ramirez and Dominga Leyva (For the Ramirez Family History, see http://www.lifebeforetheruins.com/marcos-ramirez.html . 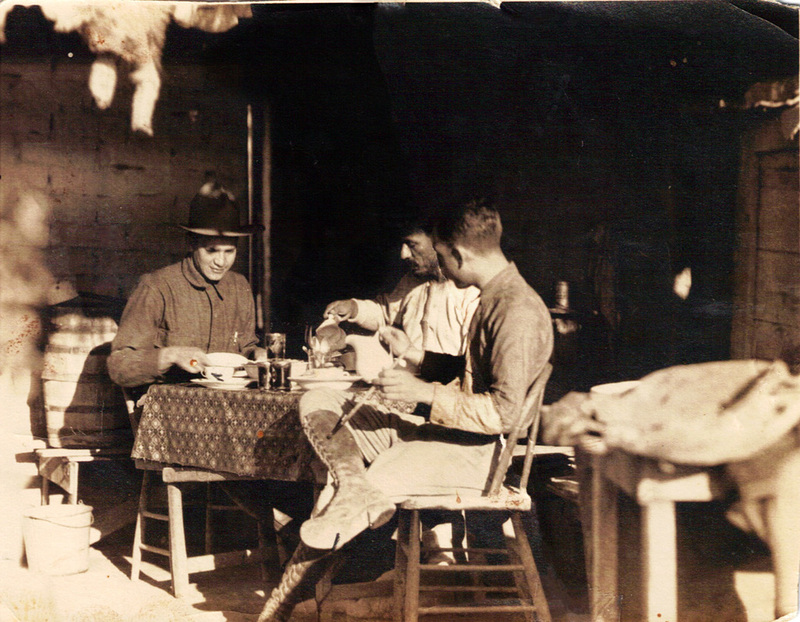 In 1880 Severiano and his family were living in Fort Stockton, where he worked as a laborer. Late in 1884 or early in 1885 Severiano moved his family to southern Brewster County and settled in a village that became known as La Coyota, along the Rio Grande River about two miles upstream from Castolon. 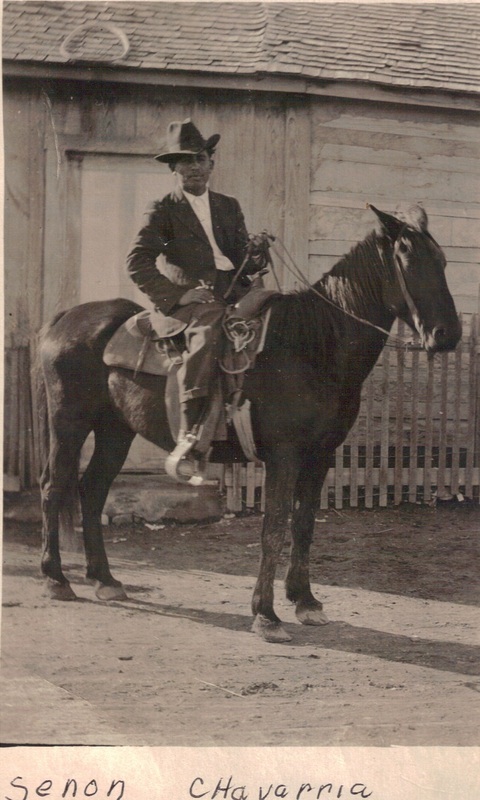 In the early 1900’s he owned 8-12 horses or mules, suggesting he was involved in hauling freight, and also kept a herd of 40 or 50 goats and 8-10 cows. Severiano died in La Coyota March 19, 1925 and is buried in the La Coyota Cemetery. Rita was still living in La Coyota with her son Juan in May 1940, but she probably moved to Fort Stockton soon afterward. She died in Fort Stockton February 26, 1941 and was buried there the same day. Severiano and Rita had sixteen children: 1. Ruperto, 2. Sixto, 3. Marcelina, 4. Fernanda, 5. Petra, 6. Valentina, 7. Rosendo, 8. Santos, 9. Felix, 10. Genaro, 11. Juan, 12. Cecilio, 13. Domingo, 14. Pablo “Gordito,” 15. Pablo “Chiquito,” 16. Senon. 1. Son Ruperto Chavarria was born in Fort Stockton in March 1877. In 1884 or 1885, at age 7 or 8, he moved with his family to southern Brewster County, settling in La Coyota. In 1900 he was working as a ranch laborer, according to the census. On November 6, 1901 he married Maria de los Angeles “Angela” Galindo in Jesus Nazareno Temple in Ojinaga. She was born circa 1884 in San Carlos, Mexico, the daughter of Filomeno Galindo and Piedad Anaya. After their wedding, Ruperto took his bride to the Chavarria family home site in La Coyota, where they made their home. 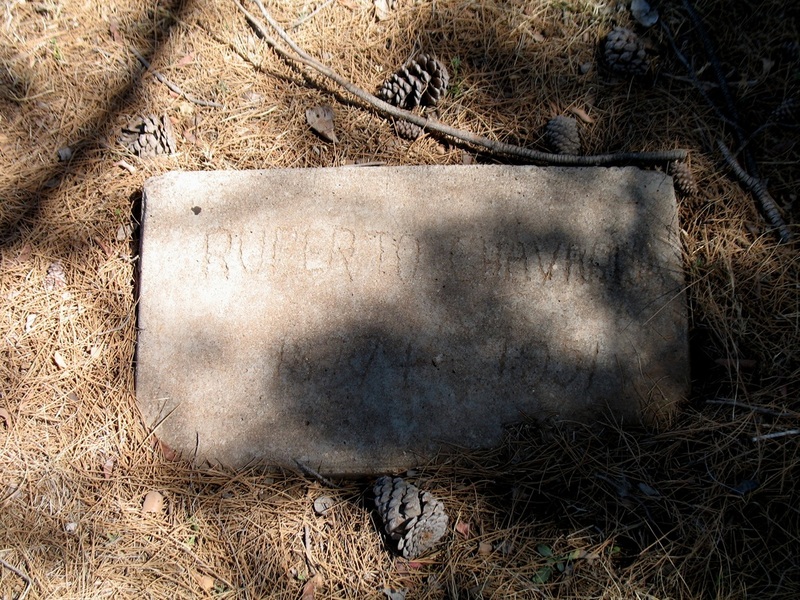 Ruperto worked as a farmer and by 1908 he had purchased Section 9 of Block 16, a 640 acre tract that includes the village of La Coyota and the lower portion of Alamo Creek. He farmed about 40 acres of this land. In 1924 he grew a small cotton crop, which he sold to La Harmonia Company in Castolon for $15.50 in cash. Otherwise raised corn, wheat and grass for livestock feed. He was an occasional customer (2-3 times per month) at the La Harmonia store in Castolon, where he maintained a small charge account. However, other than the cotton in 1924, he did not sell produce to or work for La Harmonia. Ruperto and Angela had no children. After leaving La Coyota in the early 1940’s, they moved to Alpine. They had a home along “Terlingua Road” (present day State Route 118), where Ruperto died May 17, 1951. He is buried in Holy Angels Cemetery. Angela moved to Artesia, New Mexico in 1982 and died there May 15, 1998. She is buried in Woodbine Cemetery, Artesia. 2. Son Sixto Chavarria was born in Fort Stockton in 1879. He moved to La Coyota with his family around 1885. 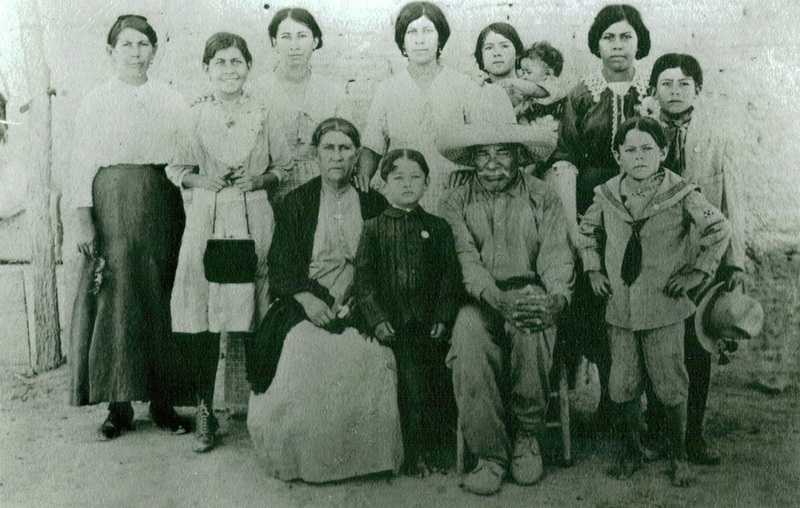 On March 6, 1902 he married Maria Hinojos in Jesus Nazareno Temple in Ojinaga. She was born in San Carlos, Chihuahua, Mexico February 12, 1886, the daughter of Manuel Hinojos and Timotea Galindo. Maria’s sister Lucia later married Sixto’s brother Rosendo Chavarria. Sixto and Maria settled in La Coyota. Sixto was a farmer and also worked as a freighter for the Chisos Mining Company in Terlingua. He was a frequent customer at the La Harmonia Store in Castolon, where he maintained a charge account. His last transaction at the store was on October 4, 1927, when he paid $3.85 in cash to settle his account. He died by April 1930; by that time his wife Maria was a widow according to the census. Maria was still living in La Coyota in 1930. She moved to Alpine in 1935 and in April 1940 she was living on South 7th Street. She died in Alpine of a stroke January 28. 1956 and is buried in Holy Angels Cemetery. A. Daughter Antolina Chavarria was born in Terlingua September 2, 1904 and was baptized there by Father Brocardus October 10, 1904. Her godparents were Tranquilino Morales and his wife, Concepcion Baeza. Antolina was living in La Coyota with her widowed mother in 1930. On July 4, 1936 Antolina married Pablo Rojo in Alpine. They had no children. Pablo was born March 22, 1906 in Alpine and was the son of Concepcion “Chon” Rojo and Angelita Salcido. He was a World War II Veteran. Pablo died in Brewster County Memorial Hospital October 29, 1962 and is buried in Holy Angels Cemetery. Antolina remained in Alpine after Pablo’s death. She was murdered at her residence on April 17, 1989. 21 year-old Joe Frank Valadez, who sometimes lived at Antolina’s residence, was accused and later convicted of the crime. Family members indicate that Antolina treated Joe like a son, but that Joe took advantage of her trust and frequently stole things and sold them. Antolina is buried next to her husband in Holy Angels Cemetery. B. 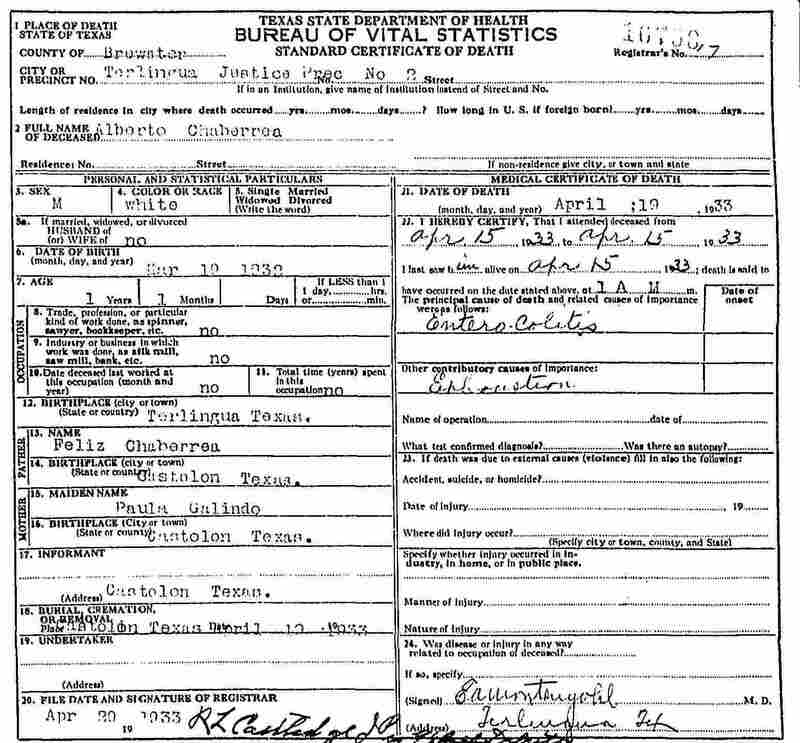 Daughter Juliana Chavarria was born in Terlingua January 28, 1907. She was baptized there by Father Brocardus April 28, 1907. Her godparents were Tomas Dominguez and his wife, Rosa Baeza. Juliana was living in La Coyota with her widowed mother in 1930. In April 1940 she was living with her mother on South 7th Street, Alpine. At that time she was working as a housekeeper for a private family. In 1939 she worked 51 weeks and earned $153.00. She married Benito “Ben” Avila in Our Lady of Peace Catholic Church in Alpine June 8, 1941. They had no children. Juliana died in Big Bend Memorial Hospital, Alpine, June 11, 1983. 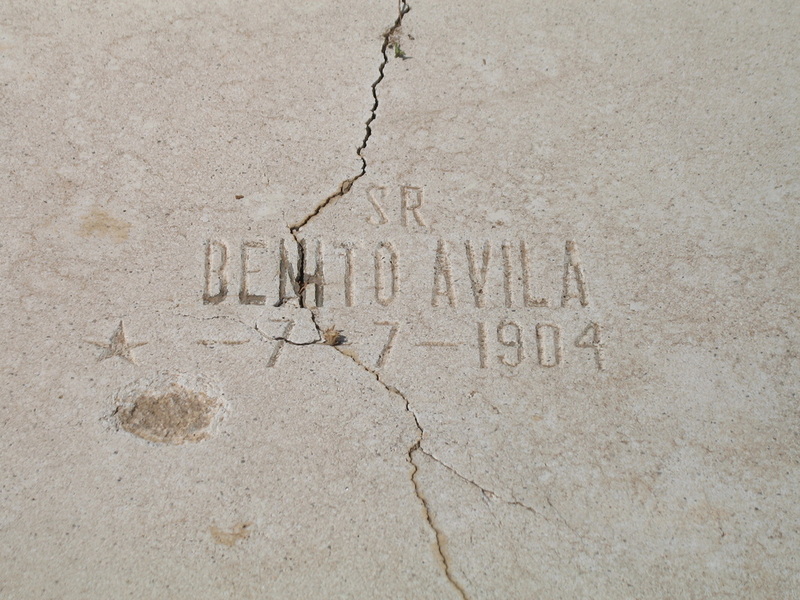 Benito died December 6, 1983. They are buried next to each other in Holy Angels Cemetery. 3. Daughter Marcelina Chavarria was born in Fort Stockton in 1881. She moved with her family to La Coyota around 1885. On July 26, 1902 she married Atilano Pando in Terlingua. They were married by J. W. Bennett, Justice of the Peace. Atilano was born circa 1874 and was the son of Carlos Pando. 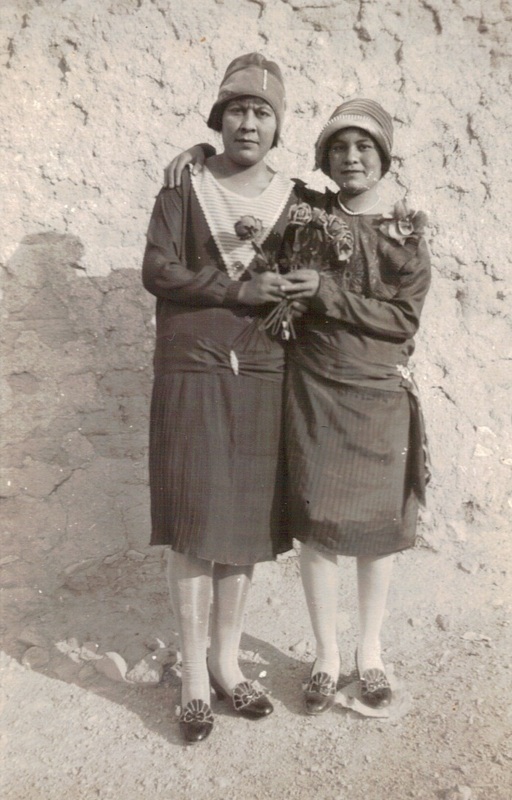 Marcelina and Atilano lived in the La Coyota – Castolon area until at least 1915. During that period Atilano worked as a stockman on a ranch and as a farmer. A. Son Jose Pando was born in La Coyota May 5, 1903. He was baptized in Terlingua May 17, 1903 by Father Brocardus. His godparents were Felipe Castillo and his wife, Luz Sanchez. (1) Son Atilano Leyva Pando was born February 18, 1944 in Mexico. He lived in Odessa from 1968 to 1973, where he worked as an installer of insulation in buildings. 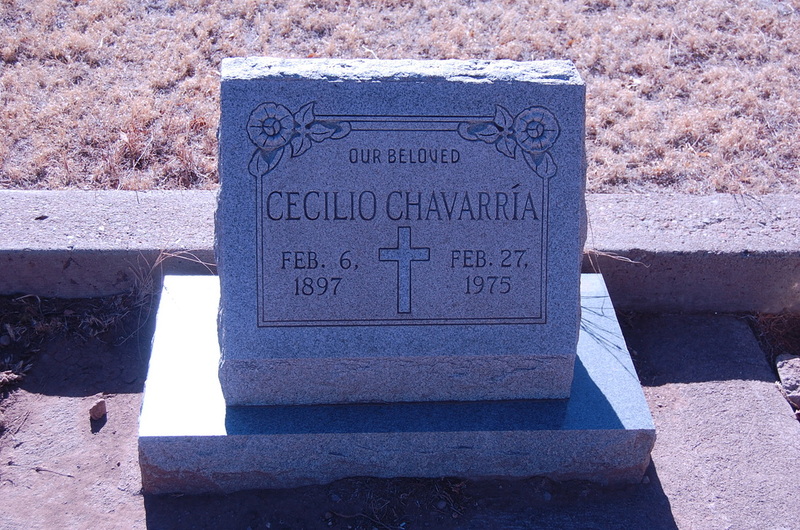 He died January 22, 1973 in Odessa and is buried in the Ector County Cemetery. (2) Son Carlos Leyva Pando was born in Castolon April 10, 1948. C. Son Alfonso Pando was born in La Coyota January 21, 1906. He was baptized in Terlingua April 21, 1906 by Father Brocardus. His godparents were Ruperto Chavarria and his wife, Angelita Galindo. Alfonso was a U.S. Military Veteran. D. Son Secundino Pando was born in La Coyota July 1, 1908. He was baptized in Terlingua September 27, 1908 by Father Brocardus. His godparents were Ruperto Chavarria and his wife, Angelita Galindo. In 1930 he was living with his parents in San Antonio de los Alamos, Chihuahua, Mexico. He was deceased by October 1962. He had one known child? (1) Daughter Maria Isabel G. Pando was born November 2, 1944 in Brewster County. She married Frank Tercero Ramos June 23, 1962 in Brewster County and they had three children. a. Son Jose Ramos was born in Brewster County May 24, 1963.
b. Daughter Lydia Isabel Ramos was born in Brewster County May 1, 1968.
c. Daughter Lisa Ann Ramos was born in Brewster County October 27, 1971. F. Daughter Andrea Pando was born November 10, 1912 in Castolon. 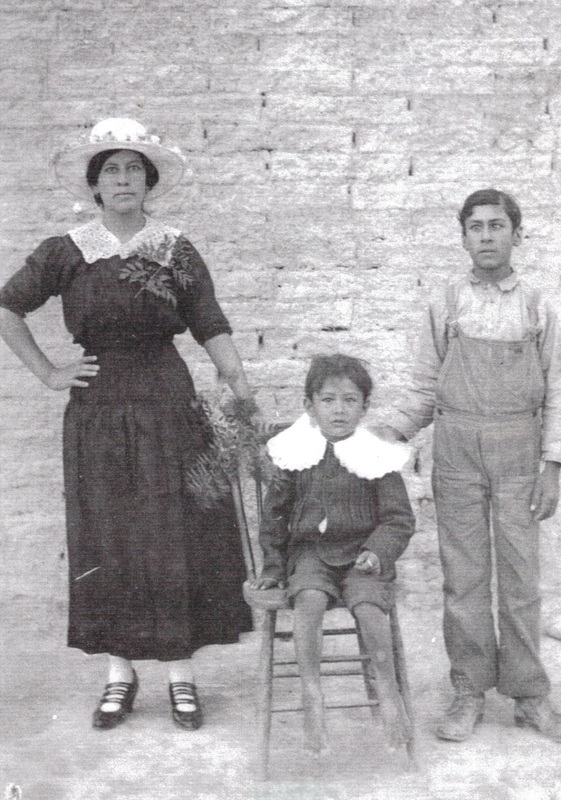 In 1930 she was living with her parents in San Antonio de los Alamos, Chihuahua, Mexico. 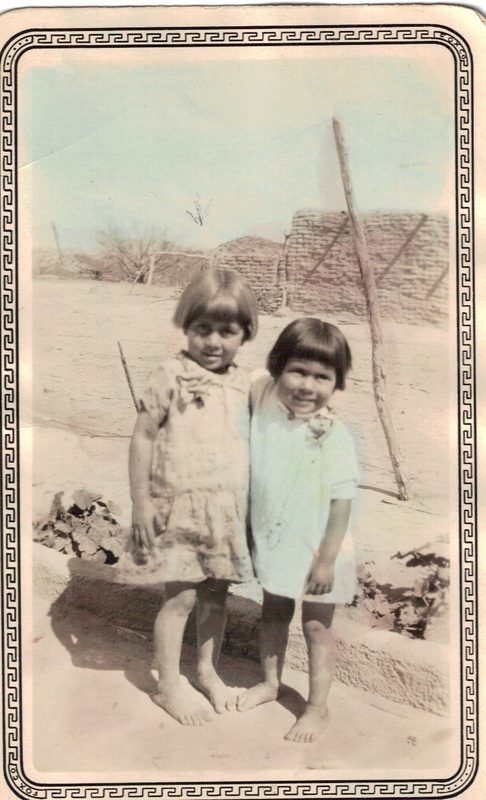 G. Daughter Juanita Pando was born May 23, 1915 in Castolon. 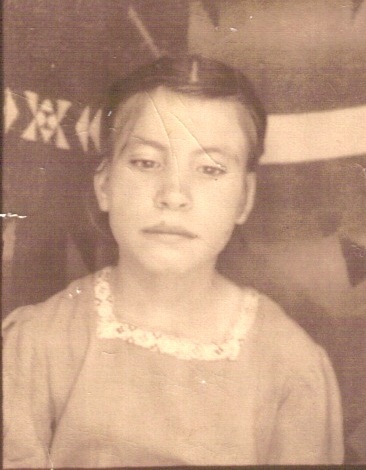 1930 she was living with her parents in San Antonio de los Alamos, Chihuahua, Mexico. (1) Son Felix Pando was born in Alpine February 23, 1940. He died in Alpine of acute respiratory infection June 4, 1940 and is buried in Alpine. (2) Daughter Juanita Pando was born in Alpine May 8, 1941. In June 2011 she was living in Midland. (3) Son Elivorio Pando was born in Alpine September 19, 1943. From 1952 to 1968 he lived in Midland. He died in Midland June 6, 1968 and is buried in Fairview Cemetery. a. Son Felix Pando III was living in Midland in June 2011. (5) Son Atilano Pando was born in Winkler County December 21, 1950. He was living in Midland in June 2011. (6) Son Jose Manuel Pando was born in Winkler County February 23, 1952. He was living in Midland in June 2011. (7) Daughter Rose Mary Pando was living in Midland in June 2011. I. Daughter Santos Pando was born circa 1919 in the state of Chihuahua, Mexico. In 1930 she was living with her parents in San Antonio de los Alamos, Chihuahua. J. Son Juan Pando was born circa 1921 in the state of Chihuahua, Mexico. In 1930 he was living with his parents in San Antonio de los Alamos, Chihuahua. He married Marcela Natividad, daughter of Rafael Natividad and Simona Ochoa. She was born June 23, 1923 in La Hacienda, Mexico. 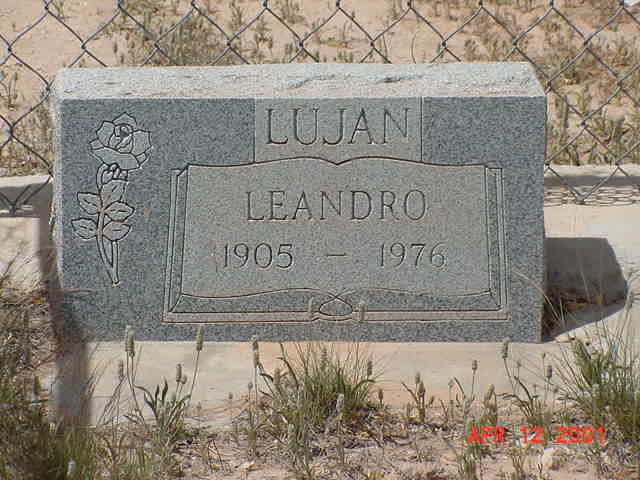 Juan died circa 1965 and is buried in Ojinaga, Chihuahua, Mexico. Marcela lived in Kermit, Texas for many years. She died in Midland Memorial Hospital May 27, 2006 and is buried in the Kermit Cemetery. (1) Daughter Elidia Pando was deceased by July 2011. (2) Son Alfonzo Pando was living in Kermit in August 2006. (3) Son Guadalupe Pando was living in Kermit in August 2006. (4) Son Juan Pando was born November 13, 1952 in Brewster County. He was living in Kermit in August 2006. 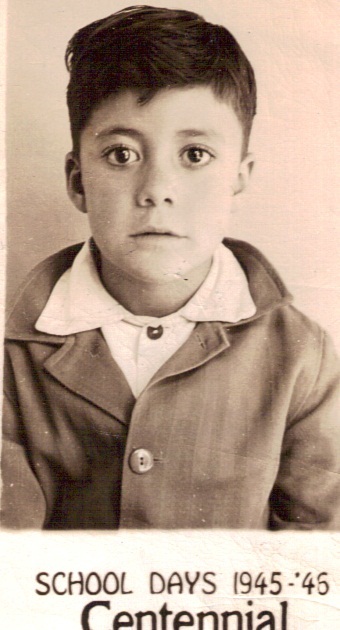 (5) Son Manuel Pando was born January 16, 1955 in Santa Elena, Chihuahua, Mexico. He married Mary Helen Holguin, daughter of Librado and Librada Holguin. Manuel was the owner of Ranch Maintenance, a professional fence-building company. He died August 17, 2006 in Medical Center Hospital, Odessa and is buried in Kermit Cemetery. Mary Helen was still living in Kermit at the time of his death. aa. Son Rigoberto Juarez, Jr. was born February 14, 1992 in Odessa. aa. Son Ahlexis Pando was born in Odessa March 30, 1994.
bb. Daughter Adriana Lynet Pando was born in Odessa June 9, 1997.
d. Daughter Elida Pando, twin of Stephen, was born January 27, 1980 in Odessa. She married Manuel E. Gonzales in Odessa September 19, 2003. She was living in Kermit in July 2011.
e. Daughter Sandra Pando born June 17, 1984 in Kermit. She married Juan R. Bonilla December 12, 2003. She was living in Kermit in July 2011.
f. Son Ruben Pando was living in Kermit in July 2011. (6) Son Carlos Pando was living in Ulysses, Kansas in August 2006. (7) Son Leonardo Pando was born July 15, 1959 in Terlingua. He was living in Ulysses, Kansas in August 2006.
a. Daughter Pamela P. Carrasco was born January 2, 1985 in Kermit. b. Son Gabriel Carrasco was born September 23, 1989 in Odessa. K. Daughter Manuela Pando was born circa 1924 in the state of Chihuahua, Mexico. In 1930 she was living with her parents in San Antonio de los Alamos, Chihuahua. 4. 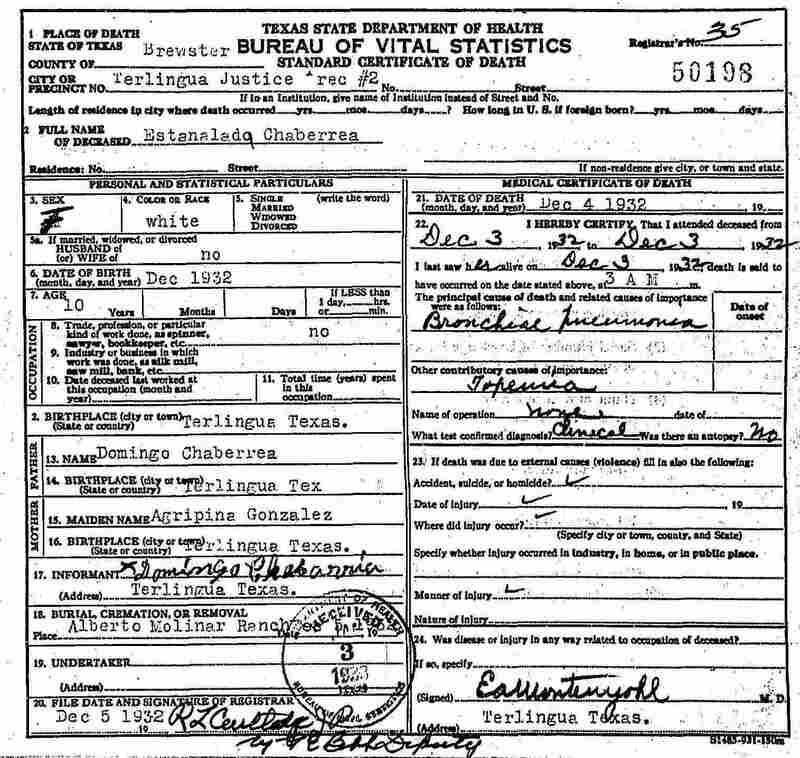 Daughter Fernanda “No-Ne” Chavarria was born May 30, 1884 in Fort Stockton. She moved with her family to La Coyota around 1885. On May 2, 1904 she married Julio Marquez Lujan, son of Natividad Lujan and Luisa Marquez. He was born April 12, 1877 in Mexico and in 1900 was working for Leonides Steele along the Rio Grande River between Castolon and Santa Elena Canyon. 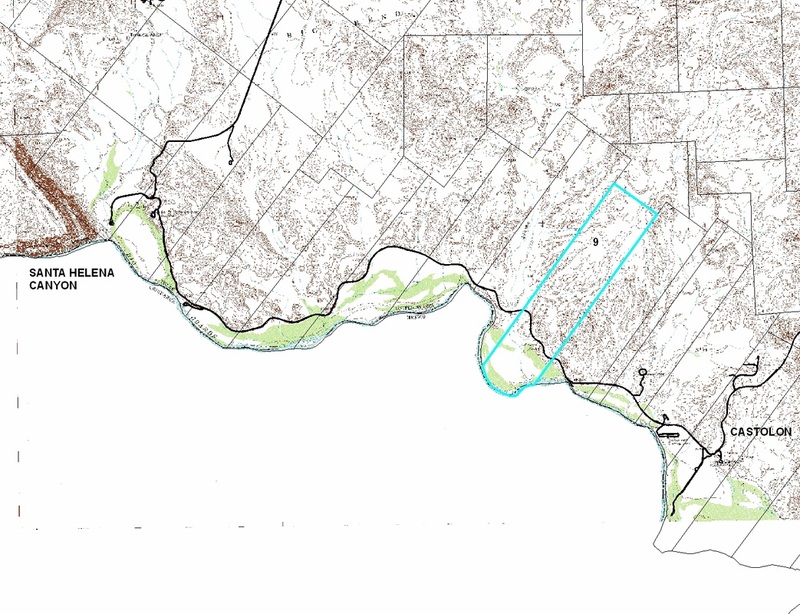 They remained in the Terlingua area until at least 1912. A. Son Leandro Lujan was born in Terlingua March 13, 1905 and was baptized there by Father Brocardus September 11, 1905. His godparents were Bernardino Garcia and his wife, Reynalda Enrique. In February 1920 he was living with his parents in Ward County and was working as a laborer on the family farm. He was a resident of Grandfalls when he died of congestive heart failure in Ward Memorial Hospital, Monahans, on August 30, 1976. He is buried in Tamarisk Cemetery. B. Daughter Amada Lujan was born in Terlingua September 13, 1906. She was baptized in Terlingua September 23, 1906 by Father Brocardus. Her godparents were Lazaro Acosta and Canuta Garcia. In February 1920 she was living with her parents in Ward County and was working as a laborer on the family farm. Amada married Rogelio Pena. (1) Daughter Lupe Valenzuela was born in Fort Stockton March 12, 1938. 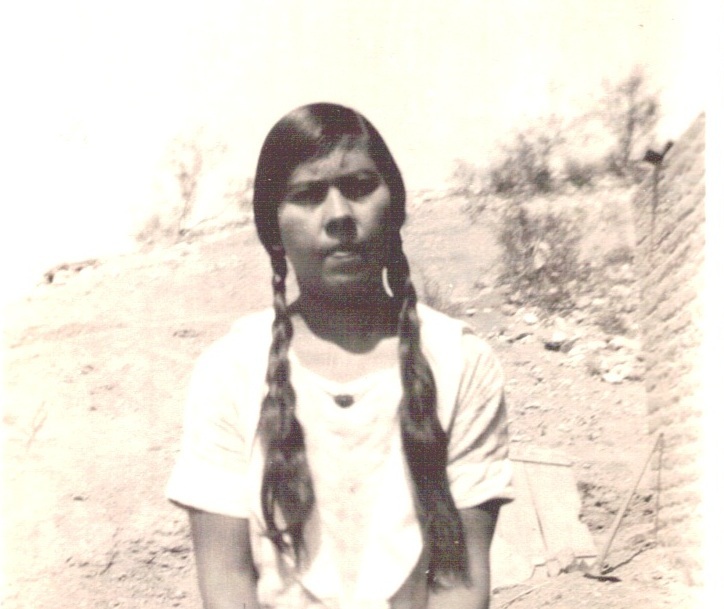 D. Daughter Josefa Lujan was born March 19, 1910 in Terlingua. She was baptized in Terlingua April 24, 1910 by Father Brocardus. Her godparents were Jose Lujan and Francisca Uranga. In February 1920 she was living with her parents in Ward County. In 1930 she was living with her parents in Fort Stockton. Josefa married Manuel Lujan, her first cousin. He was born September 10, 1904 in Terlingua, the son of Teofilo Lujan and Rafaela Acosta. (Josefa’s father Julio and Manuel’s father Teofilo were brothers). 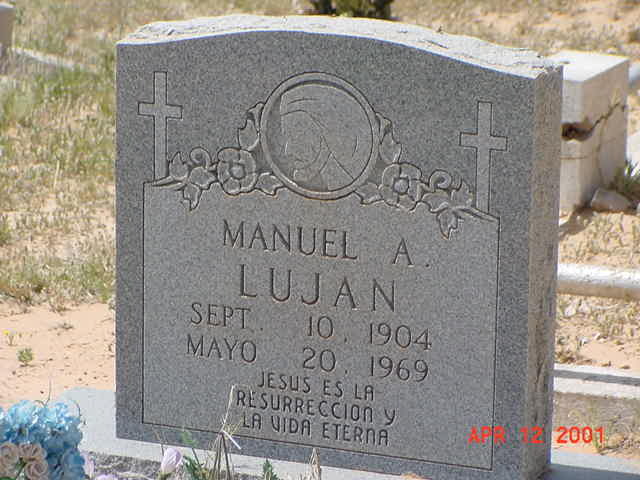 Manuel died two miles west of Monahans of an apparent heart attack on May 20, 1969. He is buried in Tamarisk Cemetery in Grandfalls. Josefa died in Monahans November 15, 1995. (1) Daughter Mary Elizabeth Lujan was born in Ward County May 8, 1943. (1) Son Felix Vasquez born in Fort Stockton November 23, 1934. He was living in California in May 2004. (2) Son Anastacio Vasquez was born in Fort Stockton April 22, 1936. He was living in California in May 2004. (3) Daughter Maria Vasquez was born in Fort Stockton December 28, 1939. She was living in Texas in May 2004. (4) Son Ramon Vasquez was born November 24, 1942 in Fort Stockton. He was living in Texas in May 2004. (5) Son Raul Vasquez was born in Fort Stockton April 26, 1945. He was living in Texas in May 2004. (6) Son Juan Vasquez was born in Fort Stockton September 30, 1946. He was living in California in May 2004. 5. 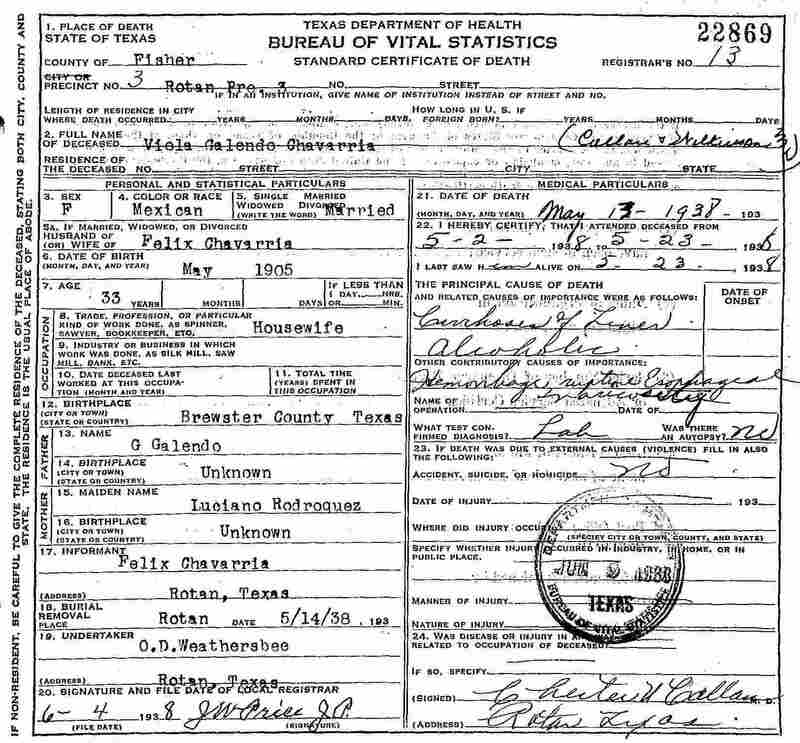 Daughter Petra Chavarria was born April 29, 1885 in La Coyota. She married Nestor Carrasco August 16, 1903 in Terlingua. They were married in Terlingua by Justice of the Peace L.V. Steele. Nestor was born in Texas in 1880, the son of Anteoclo Carrasco and Secundina DeAnda. Their first three children were born in the Terlingua area. A. 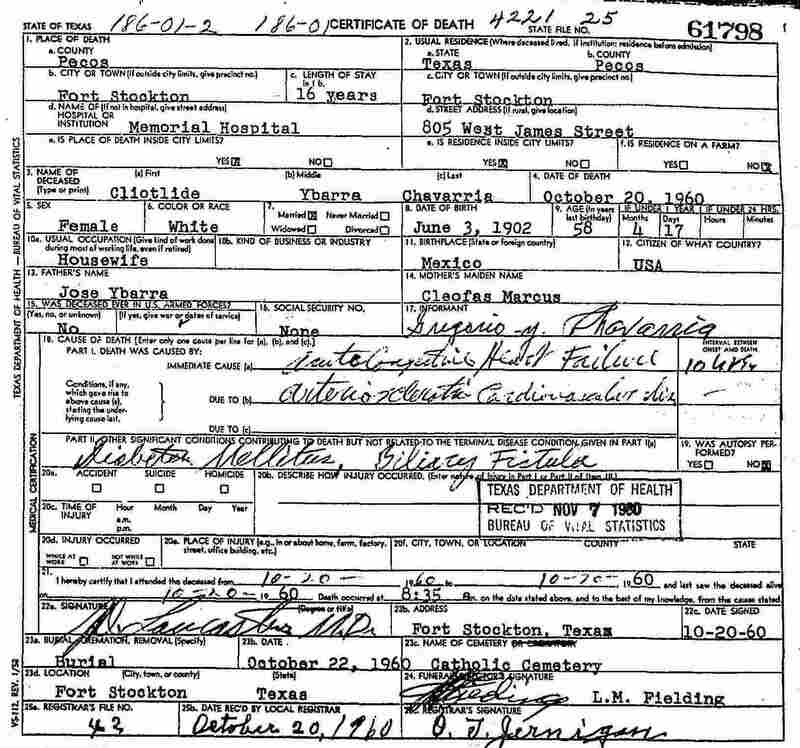 Daughter Hipolita “Pola” Carrasco was born August 12, 1904 in Terlingua and was baptized there October 9, 1904 by Father Brocardus. Her godparents were Simon Acosta and his wife, Santos Rios. 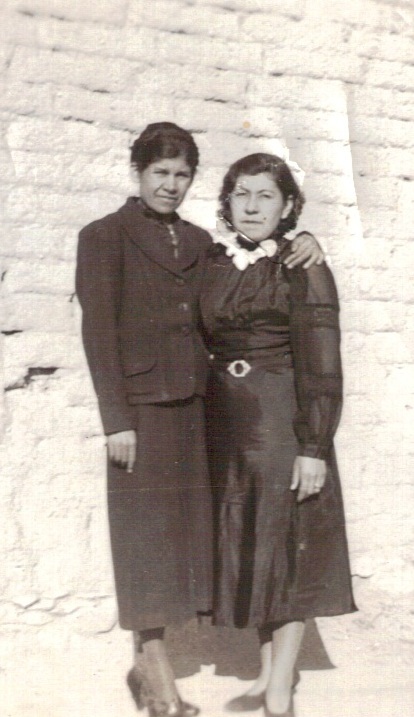 Hipolita was living with her parents in Alpine in 1910, in Ward County in 1920, and in Fort Stockton in 1930. In Fort Stockton she worked as a servant for a private family. She died in Fort Stockton May 27, 1999 and is buried in St. Joseph’s Catholic Cemetery. B. 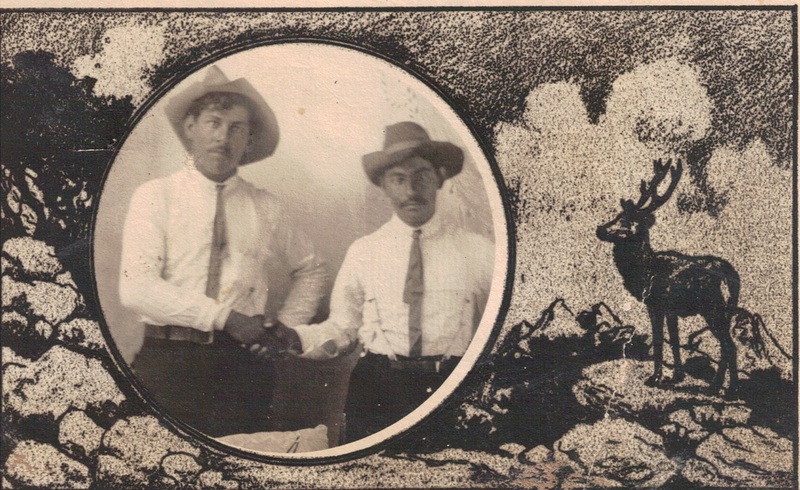 Son Jose Carrasco was born in Terlingua May 5, 1906 and was baptized there September 23, 1906 by Father Brocardus. His godparents were Lazaro Acosta and Valentina Chavarria. He was living with his parents in Alpine in 1910 and in Ward County in 1920. In 1920 he was working as a “laborer on the home farm”. He died in Fort Stockton February 13, 1984. C. Daughter Micaela Carrasco was born September 29, 1908 in Terlingua and was baptized there by Father Brocardus January 10, 1909. Her godparents were Bernardino Garcia and his wife, Reynalda Enrique. D. Daughter Petra “Petrita” Carrasco was born April 27, 1911, probably in Alpine. She was living with her parents in Ward County in 1920 and in Fort Stockton in 1930. In 1930 she was working as a servant for a private family. Her married name was Briceno. She died in Fort Stockton November 13, 1992. 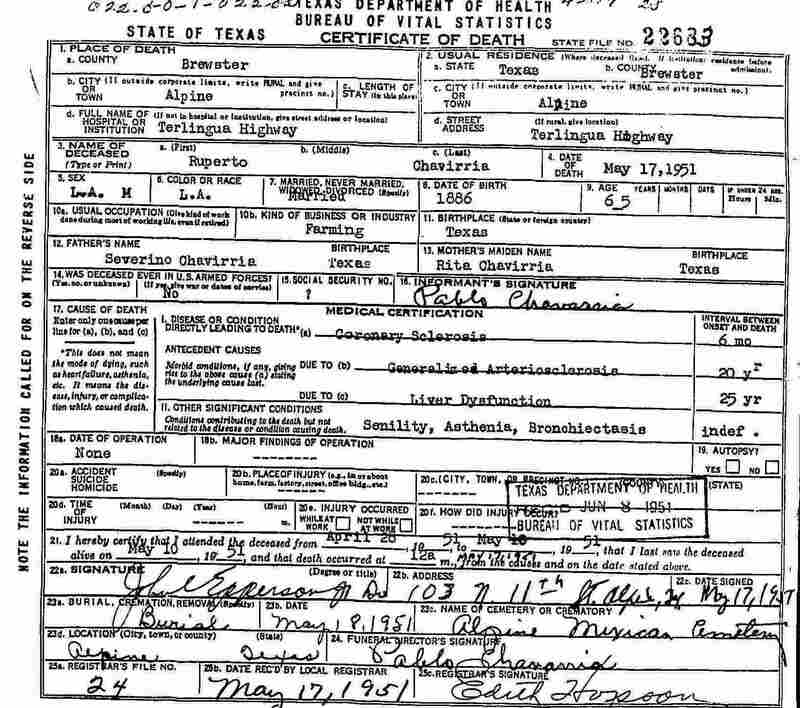 E. Son Enrique “Henry” Carrasco was born July 15, 1915 in Texas. He was living with his parents in Ward County in 1920 and in Fort Stockton in 1930. He married Margaret Saenz, born March 1, 1925. He died in Carlsbad, New Mexico November 1, 1996 and is buried in Fort Stockton, Texas. She died in Carlsbad May 24, 2010. F. Daughter Camila Carrasco was born July 18, 1918 in Texas. She was living in Ward County with her parents in 1920 and in Fort Stockton in 1930. She married Juan Moreno April 25, 1937 in Fort Stockton. He was born November 24, 1914, the son of Aniceto Moreno and Preciliana Hernandez. Camila died July 26, 1988 in Artesia, New Mexico. Juan died March 21, 1999 in Artesia. Both are buried in Twin Oaks Memorial Park, Artesia. They had eight children. (5) Daughter Pat Moreno. Her married name is DeAnda. 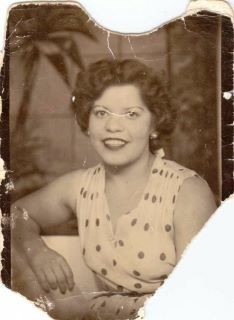 (6) Daughter Viola Moreno. Her married name is Winn. (7) Daughter Lupe Moreno. Her married name is Pressy. 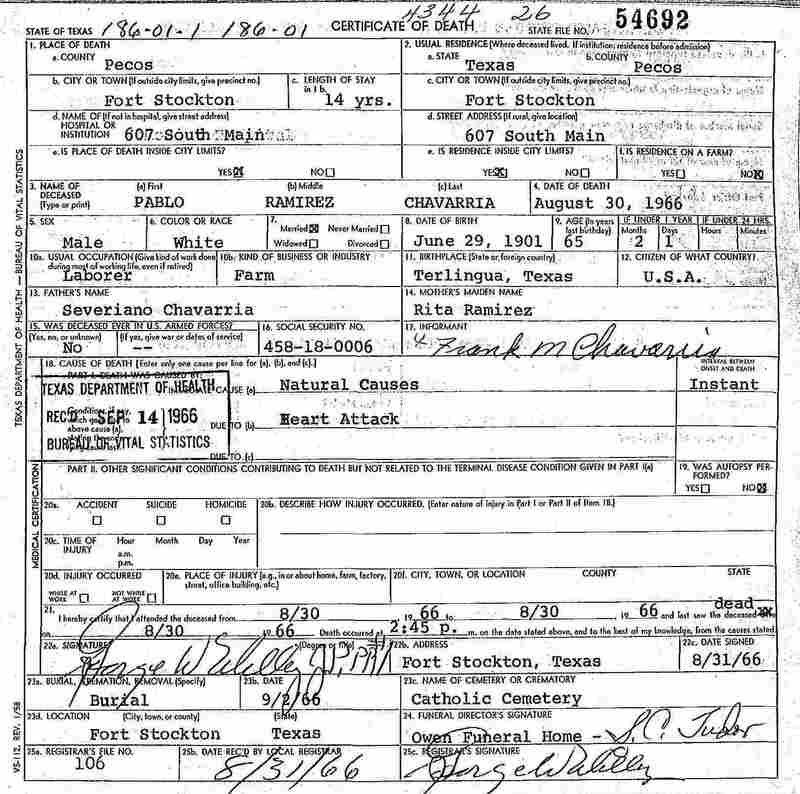 G. Daughter Mercedes Carrasco was born circa 1921in Texas. She was living in Fort Stockton with her parents in 1930. She died April 4, 1997 in Pecos County. Her married name was Blanco. 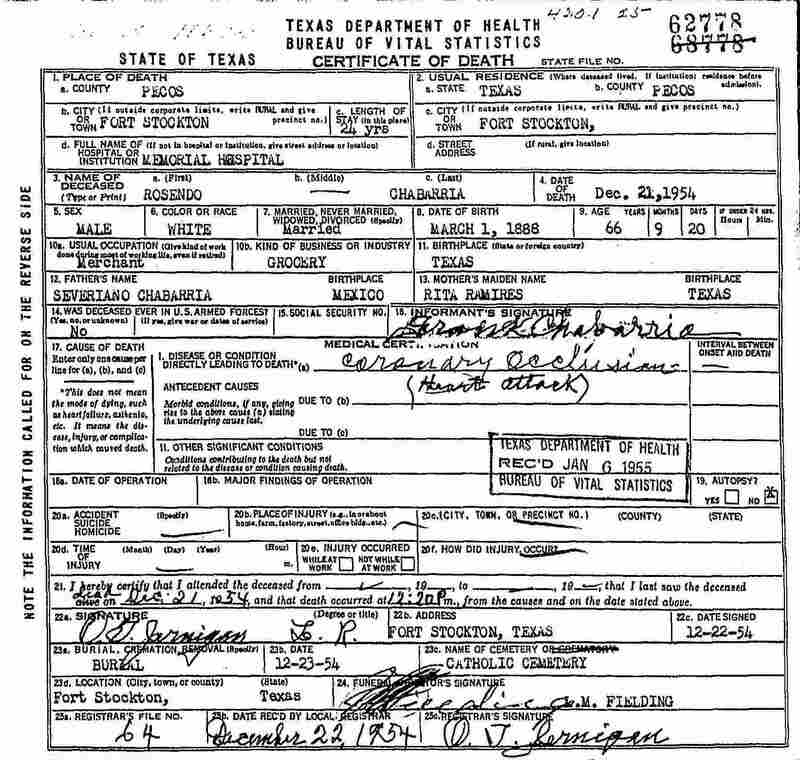 H. Son Brigido Carrasco was born October 8, 1923 in Texas. He was living with his parents in Fort Stockton in 1930. In 1955 he was working as a laborer in a filling station in Fort Stockton, He died of a stroke in Memorial Hospital, Fort Stockton March 6, 1955 and is buried in St. Joseph’s Catholic Cemetery. I. Daughter Juliana “Julia” Carrasco was born April 6, 1927 in Alpine. She was living in Fort Stockton with her parents in 1930. In May1999 she was living in Fort Stockton and was a resident of Fort Stockton when she died. 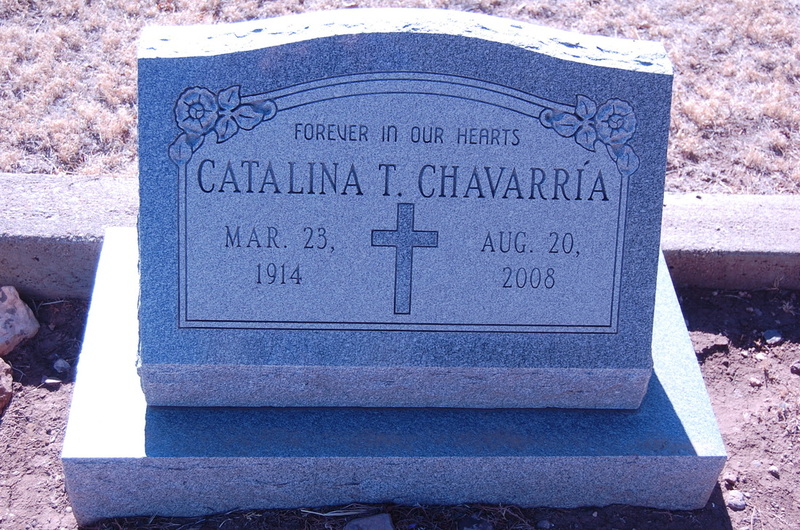 She died in Kermit, Texas December 8, 2008 and is buried in St. Joseph’s Catholic Cemetery, Fort Stockton. J. Daughter Mary Carrasco was born in Fort Stockton circa 1932 and was living in Amarillo, Texas in May 1999. She was deceased by December 2008. Her married name was Urias. 6. Daughter Valentina Chavarria was born February 14, 1887 in La Coyota. She married Antonio Franco April 29, 1907 in Castolon. He was born June 13, 1881 in Presidio, Texas, the son of Francisco Franco and Juana Molinar. Valentina and Antonio had twelve children. For details, and more information of the Franco family, see http://www.lifebeforetheruins.com/francisco-franco.html. (1) Son Jose Chavarria Ortega was born in Fort Stockton June 23, 1947. (2) Daughter Alicia Chavarria Ortega was born in Fort Stockton January 14, 1951. 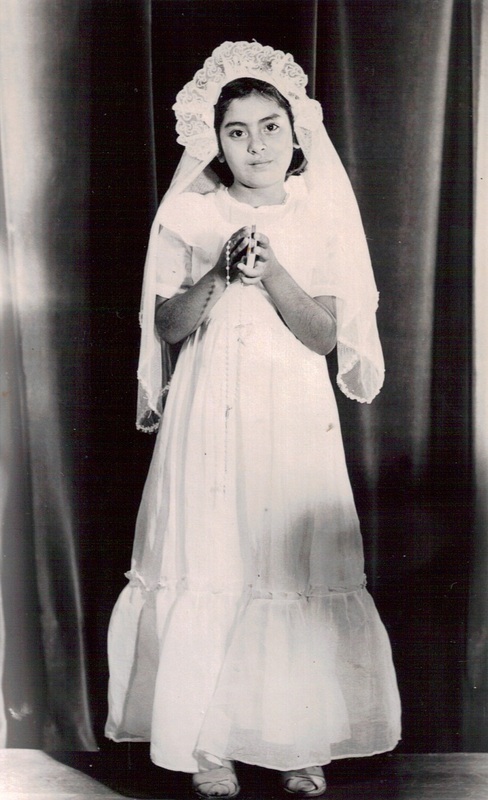 (3) Daughter Amelia Chavarria Ortega was born in Fort Stockton November 12, 1953. She married Aurelio Renteria in San Jose Catholic Church, Fort Stockton September 13. 1975. 8. Daughter Santos Chavarria was born October 20, 1892 in La Coyota. On November 17, 1920 she married Vicente Franco, son of Francisco Franco and Juana Molinar. They were married by Father Max Weyert from St. Agnes Catholic Church in Terlingua. Santos and Vicente had seven children. (For details, and for more information on the Franco family, see http://www.lifebeforetheruins.com/francisco-franco.html. War and was and was honorably discharged. He died May 15, 1983 in Big Spring. discharged. In July 2012 he was living in Big Spring. Spring, the daughter of Leon Walton Greenhill and Ruby Ruth Pope. a. Daughter Lisa Jean Chavarría was born January 30, 1975 in Big Spring. b. Son Ronnie Lee Chavarría was born January 12, 1979 in Big Spring. c. Son Tommy Justin Chavarría was born August 27, 1980 in Big Spring. d. Daughter Lacey Janelle Chavarría was born February 19, 1986 in Big Spring. Candelario Núñez Bihl. He was born February 13, 1913 in Texas, the son of Encarnacion Bihl and Josefa Núñez. hand. He died in Big Spring February 14, 1949 and is buried in Big Spring. (1) Son Ruben Bihl was born February 8, 1938 in Presidio County. He is deceased. 30 December 2000 in Big Spring and they were still living in Big Spring in May 2010. Spring December 12, 1987 and in May 2010 they were living in San Angelo. (3) Daughter Eidolina Bihl was born July 27, 1942 in Presidio County. She is deceased. County June 8, 1945 and is buried in Big Spring. (5) Daughter Elvia Bihl was born April 30, 1946 in Big Spring. She is deceased. (6) Son Salvador Bihl was born June 8, 1948 in Big Spring. In May 2010 he was living in San Angelo. 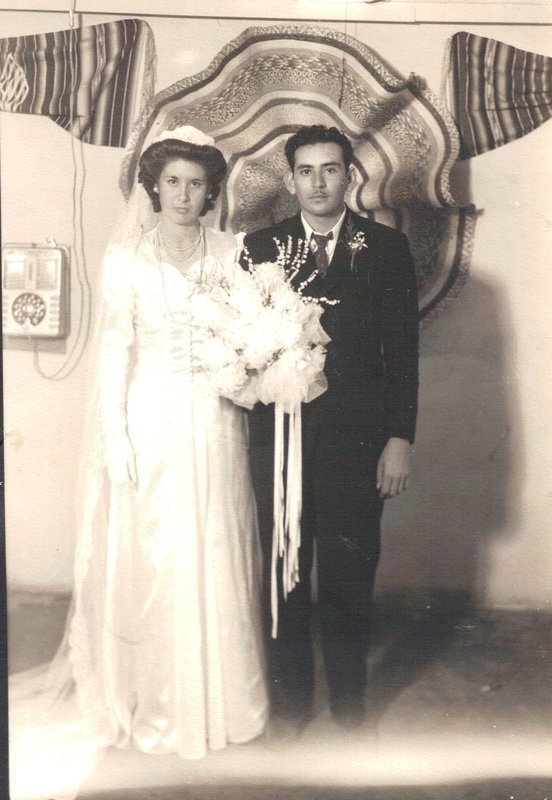 Manuel Chavarría, Sr. married Guadalupe Cervantes January 28, 1966 in Big Spring. She was born October 8, 1922 in Marfa. He died in Big Spring May 15, 1983 and she died there October 31, 2004.
a. Son James Lee Morales was born August 20, 1967 in Big Spring. He is retired from the U.S. Air Force. In July 2012 was living in Albuquerque, New Mexico and working as an instructor for Lockheed. aa. Daughter Katelyn Leigh Miller. On March 22, 1968 Alicia married Dennis Kregg Miller. They were divorced in 1973.
a. Son Kennith Bryan Miller was born October 5, 1969 in Big Spring. He married Desiree Dyer. In July 2012 they were living in Louisville, Kentucky where Kennith was working for General Electric. aa. Daughter Brooklin Tate Miller was born December 9, 1998.
bb. Daughter Carmen Page Miller was born March 14, 2001. On June 2, 1982 Alicia married Larry Williams. They met and were married in Yokota, Japan while serving there with the U.S. Air Force. Both Alicia and Larry are retired from the U.S. Air Force and in July 2012 were living in Little Rock, Arkansas. a. Daughter Kimberlee Ann Williams. aa. Daughter Kaylee Marie Light was born January 4, 2002.
bb. Son Rylan Lee Light was born May 2, 2004. Kimberlee Ann Williams married Evan Schmidt in May 2010. Kimberlee and Evan Schmidt were living in Cabot, Arkansas in July 2012.
aa. Daughter Mattie Lynn Schmidt was born November 22, 2010.
b. Son Johnathon Thomas Chavarría Williams was born October 19, 1987.
time, and Johnathon was assigned to the aircraft carrier USS John C. Stennis, CVN 74. He was disabled while on active duty in the Afghanistan War. In July 2012 Johnathon and Elin were living in Colorado Springs and were attending the University of Colorado. bb. Juliette Cadence Williams (daughter) born January 9, 2019. (1) Daughter Paula Chavarria was born February 6, 1947 in Midland. She died in Big Spring December 25, 1996. Her married name was Villarreal. (2) Daughter Yolanda Chavarria was born October 28, 1949 in Big Spring. Her married name is Villarreal. (3) Daughter Olga Chavarria was born in Big Spring July 1, 1951. She was living in Big Spring in September 2006. (4) Son Edward Chavarria, Jr. was born in Big Spring October 19, 1952. He died in San Antonio July 9, 2004.
a. Son Albert Chavarria, Jr. was born November 17, 1976 in Big Spring. In January 2012 he and his wife Genoveva were living in Anchorage, Alaska. b. Son Felix Chavarria was born December 3, 1977 in Big Spring. In January 2012 he was living in Austin. c. Son David Antonio Chavarria was born February 9. 1980 in Big Spring and was living there in January 2012.
d. Son Manuel Rey Chavarria was born November 4, 1982 in Big Spring. He married Ventura Gonzales January 10, 2000 in Big Spring. She was born November 28, 1980 in Big Spring, the daughter of Jose Gonzales and Maria Elena Velasquez. In January 2012 they were living in Big Spring. a. Daughter Erica Marie Holguin was born in Midland May 8, 1983. She was living in Big Spring in January 2012.
b. Daughter Emily Marie Holguin was born in Midland January 30, 1985, She was living in Big Spring in January 2012. (6) Son David Chavarria was born October 8, 1956 in Big Spring and died there August 10, 1995. (7) Daughter Ermelinda Chavarria was born December 31, 1965 in Big Spring and was living there in September 2008. Her married name is Caño. (8) Son Rey Chavarria was living in Midland in September 2009. (1) Son Samuel Severiano Chavarria, Jr. was born January 16, 1947 in Big Spring. He was living in Odessa in October 1998. He died in Lubbock May 9, 2003. (2) Son Felix Chavarria was born June 5, 1948 in Big Spring. He died of pneumonia in his home in Big Spring February 7, 1950 and is buried in the Mexican Catholic Cemetery, Big Spring. (3) Daughter Gloria Chavarria was born in Big Spring October 14, 1951. On December 11, 1970 she married Enrique “Ricky” Rodriguez in Odessa. They were living in Odessa in February 2011. (1) Son Felix Hilario was born in Big Spring January 21, 1946. In May 2012 he was living in San Antonio. a. Son Fidel Calderon was born May 2, 1975 in Big Spring. (3) Son John Joe Hilario was born January 16, 1952 in Big Spring. In May 2012 he and his wife Pilar were living in Carrolton, Texas. (4) Son Ricardo Hilario was born January 19, 1954 in Big Spring and died there October 25, 1989. (1) Daughter Louisa Ramirez was born September 27, 1961 in Big Spring. She was living in Big Spring in May 2012. (2) Daughter Mary Elizabeth Ramirez was born August 10, 1967 in Walker County, Texas. She married Merardo Bonilla and in May 2012 they were living in El Paso. (3) Daughter Lisa Ramirez married Sam Rodriguez and in May 2012 they were living in Big Spring, Texas. (4) Daughter Josefine Ramirez was deceased by May 2012. Her married name was Calderon. E. Son Alberto Chavarria was born in 1932 in Terlingua. He died of colitis April 19, 1933 in Terlingua and is buried in Castolon (probably La Coyota). (1) Son Gilbert Garcia was born in San Antonio June 24, 1958. He died August 31, 2010. (2) Son Edward “Eddie” Garcia was born November 7, 1960 in Chicago, Illinois. In July 2012 he was living in Big Spring. (1) Daughter Juanita Chavarria was born in Big Spring May 30, 1956. She was deceased by February 2002. (2) Son Michael Rey Chavarria was born in Odessa November 15, 1976 and was living there in February 2002. (3) Son Joe O. Chavarria was living in Odessa in February 2002. (4) Son Joe M. Chavarria was living in Odessa in February 2002. (5) Son Mike Chavarria was living in Odessa in February 2002. (6) Son Johnny Chavarria was living in Del Monte, California in February 2002. H. Daughter Maria Gloria Chavarria was born in Rotan December 19, 1937. She married Pedro “Pete” Dominguez. He was born February 14, 1925 in Shafter, Texas, the son of Isabel Dominguez and Victoria Gonzales. He served in the U.S. military during World War II. (1) Daughter Yolanda Dominguez was born April 20, 1947 in El Paso. a. Son Andres “Andrew” Dominguez, Jr. was born in Tom Green County April 18, 1964.
b. Daughter Laura Estella Dominguez was born in Tom Green County July 10, 1966.
a. Son Brendan Zachary Rodriguez was born in Odessa August 7, 1987. (2) Son Isabel “Billy” Dominguez was born in Big Spring November 23, 1958.
a. Daughter Mandi Michelle Dominguez was born in Big Spring February 5, 1991. She was living in Big Spring in July 2012.
a. Daughter Megan Leigh Dominguez was born August 17, 1989 in Austin. b. Son Aaron Ryan Dominguez was born April 20, 1997 in Austin. a. Daughter Ashton Dominguez was born November 27, 1992 in Big Spring. (1) Daughter Angelique Michelle Gomez was born May 25, 1969 in Big Spring. She married William Latimer November 20, 2007 in Big Spring and in July 2012 they were living in Big Spring. 10. Son Genaro Chavarria, twin of Felix, was born in La Coyota in May 1894. He died as a small child after he was bitten by a rabid skunk. 11. Son Juan Chavarria was born October 17, 1896 in La Coyota. Between November 1917 and October 1918 he sold nearly 43 cords of fuel wood to the Study Butte Mining Company for $340.60. On November 3, 1917 Juan married Cleotilde Ybarra. They were married by Father Antonio Alonso from St. Agnes Catholic Church in Terlingua. She was born June 3, 1902 in the State of Chihuahua, Mexico to Jose Ybarra and Cleofas Marquez. 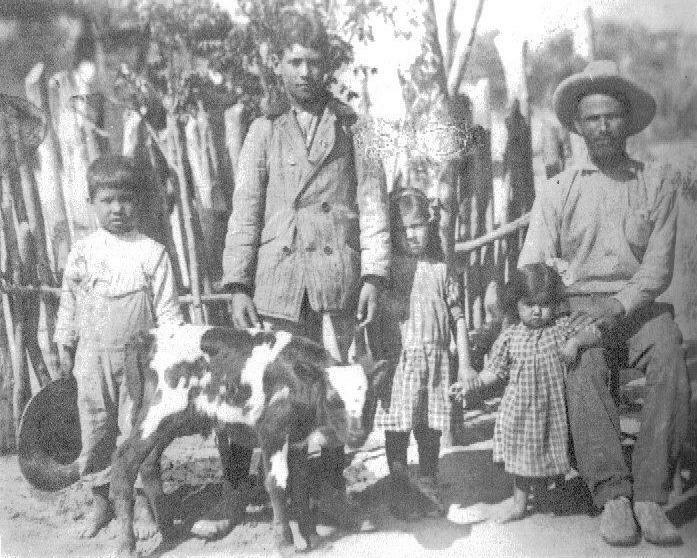 Juan and Cleotilde settled in the Village of La Coyota and remained there at least through May 1940. During that time Juan worked as a farmer. In 1942, when Juan registered for the draft, he was employed by the Texas Mercury Company in Study Butte. By 1944 they had moved to Fort Stockton, where they remained until their deaths. She died of heart failure in Fort Stockton Memorial Hospital October 29, 1960. He died January 24, 1961, also of heart failure. Both are buried in the Fort Stockton Catholic Cemetery. A. Son Gregorio Chavarria was born in La Coyota November 27, 1918. He was a student at the Castolon School in 1932 and 1933. He was living with his parents in La Coyota in May 1940. On August 18, 1942 he married Trinidad “Trini” Garcia in Alpine. She was born in Terlingua May 14, 1920, the daughter of Dolores Garcia and Luisa Muñoz. Gregorio and Trinidad’s first child was born in Alpine in 1943, but soon afterward they moved to Fort Stockton. 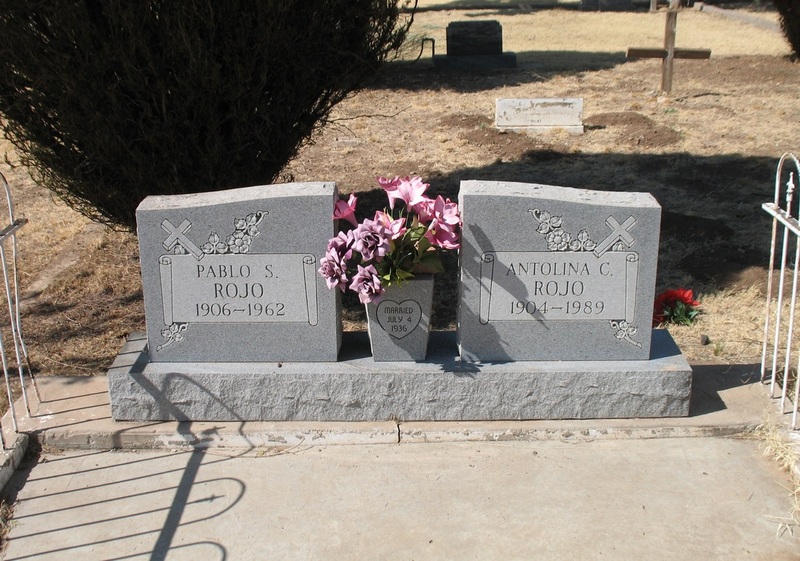 Gregorio and Trinidad lived in Fort Stockton until their deaths. Trinidad died July 17, 1998 in Pecos Memorial Hospital. Gregorio died at his residence January 12, 2005. 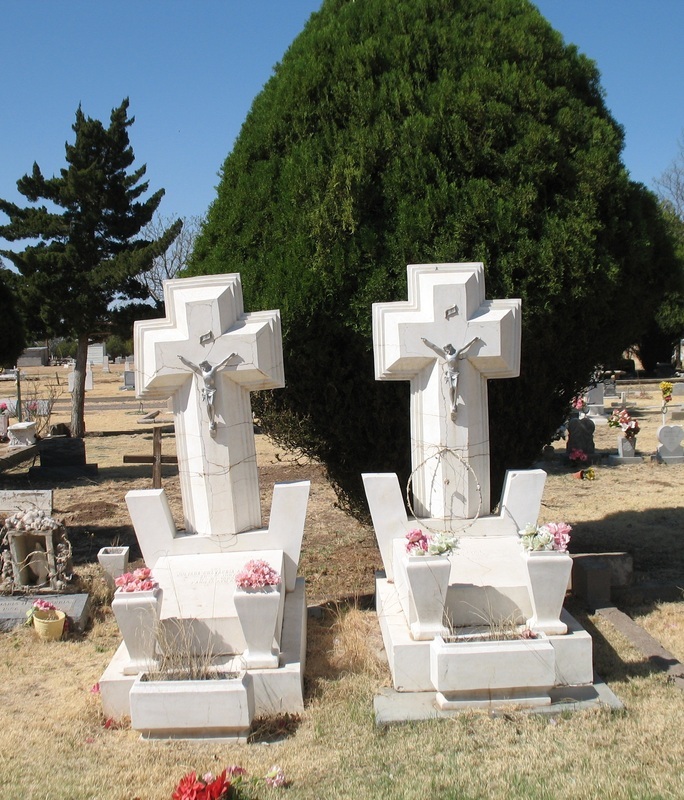 Both are buried in East Hill Cemetery, Fort Stockton. a. Son Rene Chavarria Jaquez was born February 11, 1965 in Pecos. b. Daughter Sonia Chavarria Jaquez was born August 11, 1966 in Pecos. a. Daughter Lorraine Fernandez Chavarria was born in El Paso May 4, 1969.
b. Daughter Lisa Chavarria was born in El Paso December 2, 2006. She married Charles Robert Stevens in Austin December 2, 2006. They have one son. (3) Son Samuel Chavarria was born July 27, 1948 in Fort Stockton, In January 2005 he and his wife Alicia were living in Houston. a. Daughter Selena Allene Almendarez was born November 3, 1980 in Odessa. b. Son Esteban Orlando Almendarez was born February 9, 1988 in Fort Stockton. (5) Son Daniel "Danny" Chavarria was born October 30, 1958 in Fort Stockton. On August 13, 1983 he married Rosa Linda Rodriguez in St. Joseph’s Catholic Church in Fort Stockton. In January 2005 they were living in Fort Stockton. B. Daughter Mauricia “Wisha” Chavarria was born September 22, 1929 in La Coyota. She was living in La Coyota with her parents in May 1940. She married Brigido “Vico” Garcia and they made their home in Fort Stockton. Mauricia died in Fort Stockton November 26, 2002 and is buried in the Fort Stockton Catholic Cemetery. They had no children. (1) Daughter Sylvia Chavarria was born in Fort Stockton March 29, 1957. (2) Daughter Erma Herrera Chavarria was born in Fort Stockton March 11, 1960. (3) Daughter Ninfa Chavarria was born January 5, 1965 in Fort Stockton. (1) Son Ricardo Lee Chavarria was born May 14, 1958 in Fort Stockton. a. Son Andrew Luis Bustos was born in Fort Stockton April 8, 1985.
b. Son Alexander Luis Bustos was born in Fort Stockton December 12, 1987.
c. Daughter Andrea Bustos. Her date and place of birth are not available. (3) Son Raul Ramos Chavarria was born June 5, 1965 in Fort Stockton. (4) Daughter Raquel Ramos Chavarria was born November 9, 1972 in Fort Stockton. (1) Son Ruben Chavarria was born September 1, 1960 in Fort Stockton. (2) Son Armando Chavarria was born April 20, 1963 in Fort Stockton. (3) Son Orlando Chavarria was born September 16, 1965 in Fort Stockton. (1) Daughter Melissa Anita Gonzales was born in Fort Stockton April 24, 1969. (2) Daughter Veronica Gonzales. Her date and place of birth are not available. 12. Son Cecilio Chavarria was born in La Coyota February 6, 1897 and in June 1922 was still living in that area. He married Catalina Tucar, born March 23, 1914 in Terlingua to Jose Tucar and Felipa Sanchez. Cecilio and Catalina made their home in Alpine and lived there until their deaths. 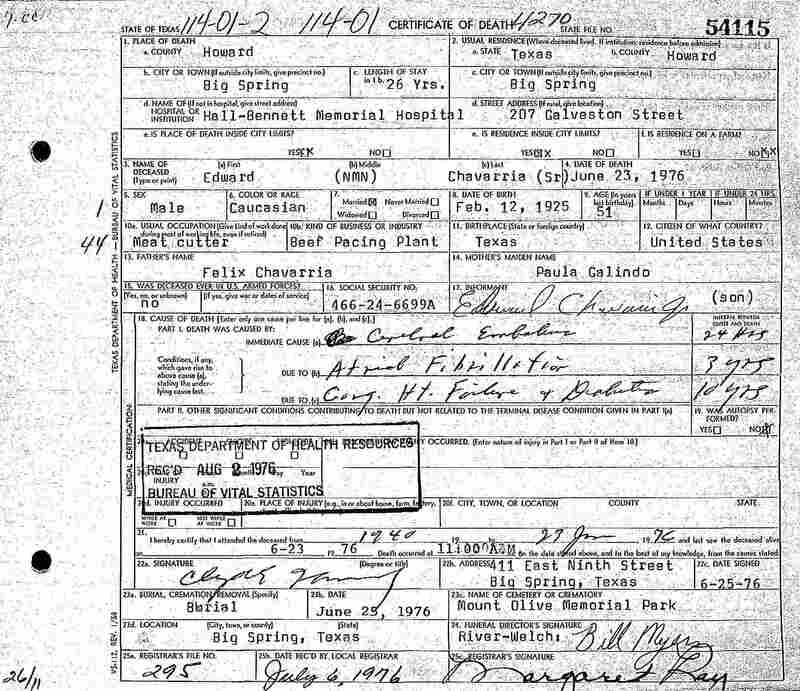 Cecilio registered for the draft in 1942. He died in Big Bend Memorial Hospital of respiratory failure February 27, 1975. Catalina died in Valley Care Center, Alpine August 20, 2008. Both are buried in Holy Angels Cemetery. A. Daughter Juanita “Janie” Chavarria was born in Alpine January 16, 1935. Her married name is Lee. She was living in Alpine in December 2008. B. Son Eliverto “Bobby” Chavarria was born March 16, 1937. He died of cancer in Fort Stockton Dec 15, 2008 and is buried in Holy Angels Cemetery, Alpine. He married Juanita Ray Fuentez. She was born in Coke County January 27. 1940, the daughter of Raymundo Fuentez and Juanita Marquez. She died in Arlington October 4, 2009. (1) Daughter Annett Chavarria was born July 6, 1960 in Andrews County. She was living in Arlington in December 2008. Her married name is Boyles. (2) Daughter Cynthia “Cindy” Chavarria was born July 24, 1966 in Tom Greene County. She was living in Arlington in December 2008. Her married name is Calzada. (3) Son Cecil Albert “C.A.” Chavarria was born September 30, 1967 in Tom Green County. He was living in Arlington, Texas in December 2008. (4) Daughter Cheryl Chavarria was born August 18, 1970 in Tom Green County. She was living in North Carolina in December 2008. Her married name is Storey. 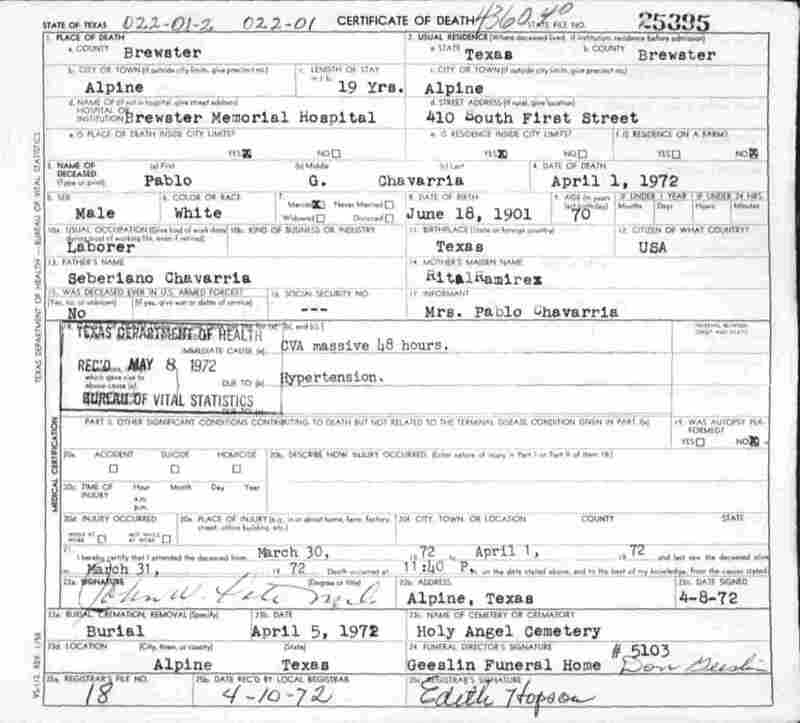 Eliverto married Oralia “Lena” Garza in Alpine December 28, 1978. They had no children, but Oralia had two children earlier: (1) Daughter Mary Macomber was living in Fort Stockton in December 2008. (2) Son Jimmy Jimenez was living in San Angelo, Texas in December 2008. (1) Daughter Jo Elda Polanco was born April 29, 1969 in Alpine. (2) Son Robert Lee Polanco was born in Alpine January 27, 1973. 13. Son Domingo Chavarria was born January 30, 1899 in La Coyota. Between June 1917 and October 1918 he sold nearly 60 cords of fuel wood to the Study Butte Mining Company for $532.50. In June and July 1924 he earned $82.55 for hauling freight for the La Harmonia Company in Castolon, and in February and March he earned $109.96 for hauling freight for the same company. 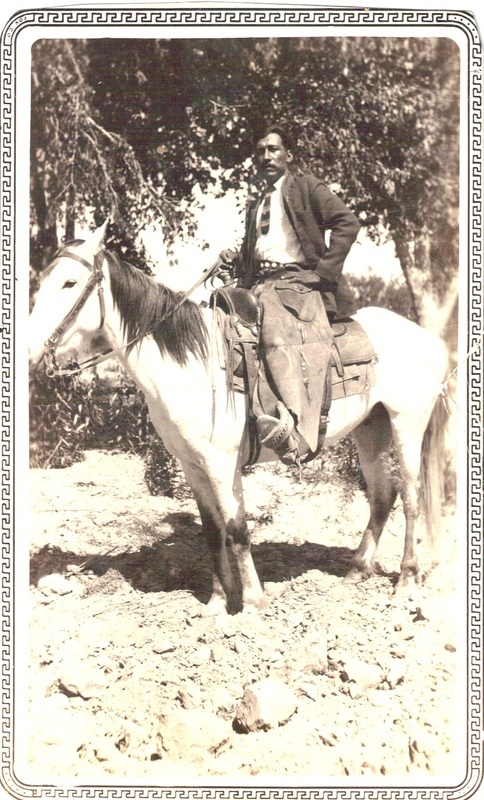 He remained in the La Coyota area until at least 1932, working as a farmer and a ranch hand. By 1934 he had moved his family to the Imperial area, where he lived until his death. A. 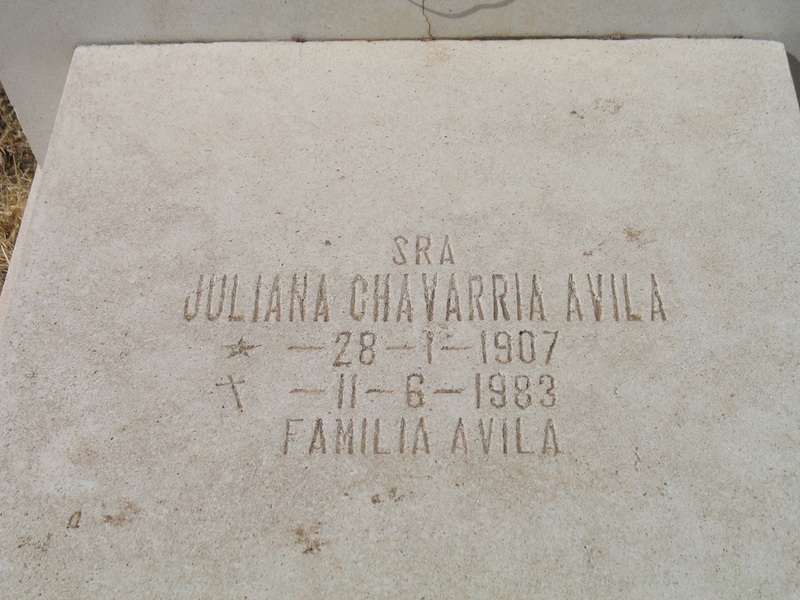 Son Julio Chavarria was born circa 1921 in La Coyota and was living there with his parents in 1930. B. Daughter Estanislada Chavarria was born in December 1922 in La Coyota. She died of pneumonia December 4, 1932 and is buried on the Alberto Molinar Ranch. (1) Son Merced Jimenez, Jr. was born in Pecos County November 6, 1947. (2) Son Ruben Jimenez was born in Ward County December 28, 1949. D. Daughter Crispina “Pina” Chavarria was born circa 1930 in La Coyota. She married Chavo Jaquez and in July 2004 they were living in Odessa. 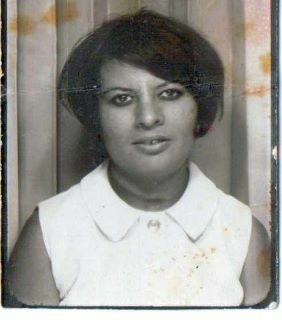 E. Daughter Dominga Chavarria was born July 4, 1932 in La Coyota. Angelita Galindo Chavarria served a midwife for her birth. Dominga was a resident of Crane when she died in Odessa January 14, 1995. Her married name was Primera. (1) Daughter Aurora Heredia was born in Ward County. In July 2004 she was living in Carne. Her married name was Garcia. (2) Son Ricardo “Ricky: Heredia was born in Crane December 5, 1956. In July 2004 he and his wife Martha were living in Crane. (3) Son Johnnie Heredia was born in Crane March 27, 1958. In July he and his wife Virginia were living in Phoenix, Arizona. (4) Son Ismael Heredia, Jr. was born December 3, 1961 in Crane. In July 2004 he and his wife Bertha were living in Andrews, Texas. (5) Son Guadalupe “Wally” Heredia was born October 20, 1966 in Crane. He and his wife Amalia “Molly” were living in Midland in July 2004. (1) Daughter Laura Rachael Gomez was born September 30, 1956. (2) Daughter Irma Gomez was born March 6, 1958. (3) Son James Gomez was born October 29, 1960. (4) Son Rene Gomez was born July 13, 1966. (5) Son Mark Gomez was born September 5, 1968. H. Son Hilario Chavarria was living in Imperial in February 1946. He was deceased by July 23, 2004. I. An unnamed son was born October 11, 1941 in Buena Vista. He died a few minutes after birth and is buried in Buena Vista Cemetery. In 1901 Severiano Chavarria and Rita Ramirez had twin boys and named both of them Pablo. One was a little heavier than the other, so he became known as Pablo Gordito, while the thinner one was Pablo Chiquito. 14. Son Pablo “Gordito” Chavarria was born June 18, 1901 in La Coyota. He was baptized in Terlingua September 22, 1901 by Father Brocardus. In April 1930 he was living with his widowed mother in La Coyota and was working as a farm laborer. On June 30, 1933 he married Agustina Silvas in Terlingua. They were married by Justice of the Peace Robert L. Cartledge. Agustina was born in Castolon circa 1912, the daughter of Leandro Silvas and Maria DeAnda. See http://www.lifebeforetheruins.com/leandro-silvas.html for more information on the Silvas family. (1) Son Daniel C. Celaya was born August 18, 1964 in Brewster County. In April 2008 he was living in Alpine. a. Son Jonah Martin Sarabia was born May 23, 1987 in Pecos County. b. Daughter Brittney Celeste Sarabia was born June 23, 1990 in Harris County. c. Daughter Vyctoria Lauren Sarabia was born February 14, 1994 in Harris County. Susana and Donaciano divorced and she later remarried, but no additional information is available. B. Son Jose Chavarria was born November 7, 1946. He was living in Alpine in 2011. C. Daughter Rita Chavarria was born January 20, 1949 in Brewster County. In 2011 she was living in Amarillo, Texas. 15. Son Pablo “Chiquito” Chavarria was born June 18, 1901 in La Coyota. He was baptized September 22, 1901 in Terlingua by Father Brocardus. In April 1930 he was living with his widowed mother in La Coyota and was working as a farm laborer. By 1935 he was living in Alpine, and between 1952 and 1966 he was living in Fort Stockton. He married Maria Morales in Brewster County May 7, 1938. She was born April 17, 1903 in Terlingua, the daughter of Tranquiliano Morales and Concepcion Baeza. Pablo died of a heart attack in Fort Stockton August 30, 1966. He is buried in Fort Stockton Catholic Cemetery. Maria was still a resident of Fort Stockton when she died in Odessa January 17, 1986. A. Daughter Josefina Chavarria was born in Alpine July 26, 1935.
a. Son Marc James Chavarria was born January 27, 1988 in Alpine and was living there in January 2010.
b. Daughter Rachael Dannielle Chavarria was born in Alpine September 16, 1991 and was still living there in January 2010. (1) Son Francisco “Frank” Chavarria was born October 30, 1960. In January 2010 he and his wife Cindy were living in Midland. a. Daughter Amanda Chavarria was born May 31, 1988 in Fort Stockton. In July 2007 she was living in Seguin, Texas. a. Daughter Dioni Urquidez was born January 13, 1978 in Brewster County. In July 2007 she was living in Midland. a. Son Eddie Terrazas. Jr. was born in Midland June 20, 1996.
a. Daughter April Chavarria Singh was born April 30. 1987 in Fort Stockton. b. Daughter Katy Chavarria Singh was born March 19, 1994 in Fort Stockton. c. Daughter Raquel Chavarria Singh was born September 27, 1996 in Fort Stockton. a. Son Cipriano Francisco Amaro III was born in Fort Stockton June 26, 1991.
b. Son Eduardo Lorenzo Amaro was born in Fort Stockton July 11, 1997. (6) Son Larry Chavarria and his wife Becky were living in Imperial in January 2010. 16. Son Senon Chavarria was born June 23, 1906 in La Coyota. He was baptized in Terlingua September 23, 1906 by Father Brocardus. His godparents were Simon Acosta and his wife, Santos Rios. Senon lived in the La Coyota area until at least 1933, working as a ranch hand and a farmer. (1) Daughter Katheryn Pauline Chavarria was born in Fort Stockton May 3, 1955. She married Guy Brown November 16, 1985 in Fort Stockton. They were living in Fort Stockton in May 2005. Katherine also had a daughter Evelyn Scott, who was living in Fort Stockton in May 2005. B. Son Roberto Chavarria was born in Terlingua in April 1931. He died of pneumonia September 4, 1932 and is buried in the La Coyota Cemetery. (1) Son Ramon Gonzales, Jr. was born May 2, 1954 in Fort Stockton. (2) Son Faustino Gonzales was born January 4, 1956 in Midland. (3) Daughter Luz Maria Gonzales was born March 24, 1957 in Fort Stockton. (4) Son Roberto Gonzales was born June 29, 1962 in Odessa. (1) Daughter Sylvia Ann Gonzales was born in Palmer County, Texas November 28, 1963. (2) Son Valente Gonzales, Jr. was born in Fort Stockton October 13, 1966. 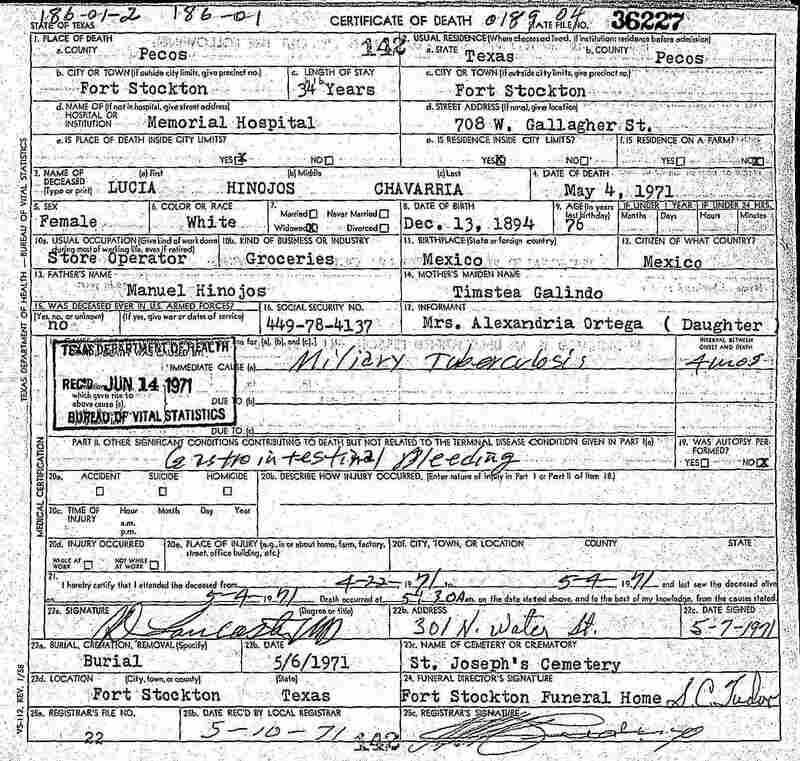 (a) Birth date June 12, 1909 in her death record. (b) Buena Vista was a small town about six miles southeast of Imperial. In the early 1900’s it grew in anticipation of the arrival of the Kansas City, Mexico and Orient Railway. It once had a post office, a hotel, a bank, a school and a church. But the railroad bypassed the town and in was abandoned in the 1950’s. (From the Handbook of Texas Online). 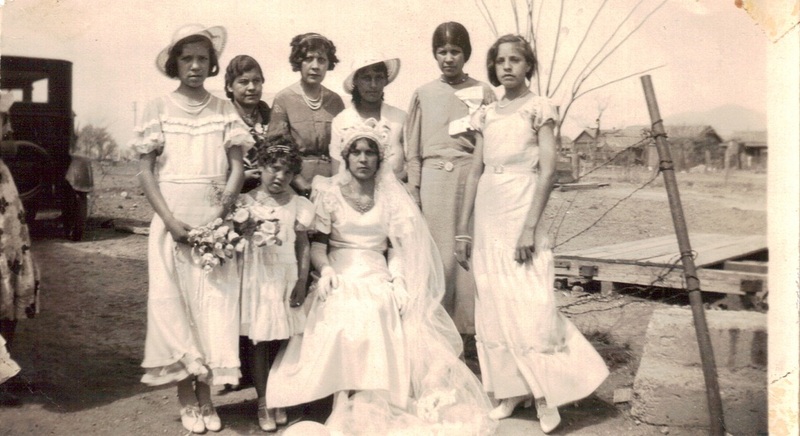 Marriage and baptism records from San Pablo, Meoqui, Chihuahua, Mexico, accessed via the FamilySearch web site. Marriage records from Jesus Nazareno Church, Ojinaga, Chihuahua, Mexico, accessed via the FamilySearch web site. Marriage and baptism records from St. Joseph’s Catholic Church in Fort Davis, copies held by the Archives of the Big Bend, Sul Ross State University, Alpine, Texas. 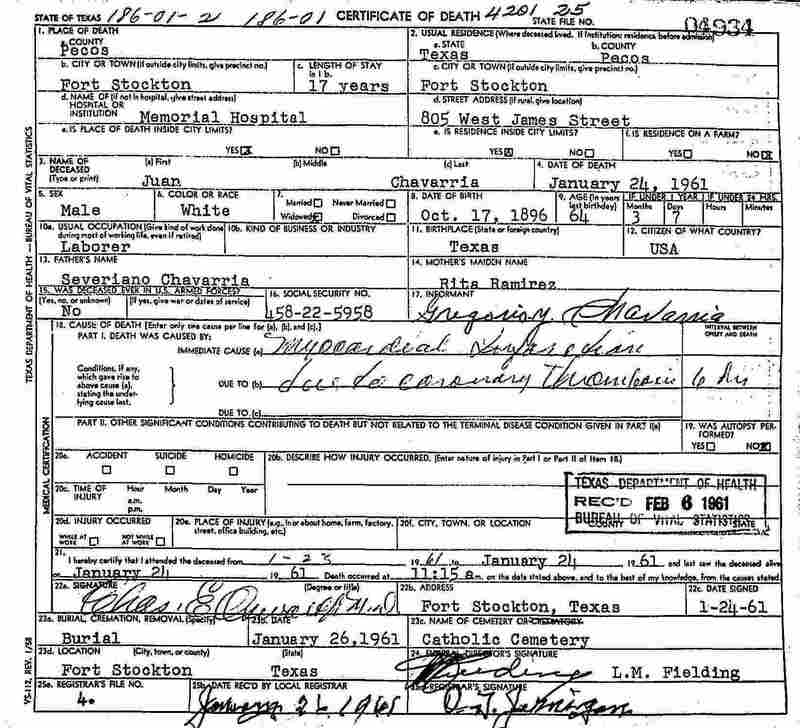 Marriage, baptism and death records from St. Agnes Catholic Church in Terlingua, available on microfilm from the L.D.S. Church. 1880 U.S. Census for Pecos County. 1900, 1910, 1920, 1930 and 1940 U.S. Census for Brewster County. 1920 U.S. Census for Ward County. 1930 U.S. Census for Howard County. 1930 U.S. Census for Pecos County. La Harmonia Company records, Wayne Cartledge Collection, Archives of the Big Bend, Sul Ross State University, Alpine, Texas. Tax assessment records for Brewster County, 1898-1912. 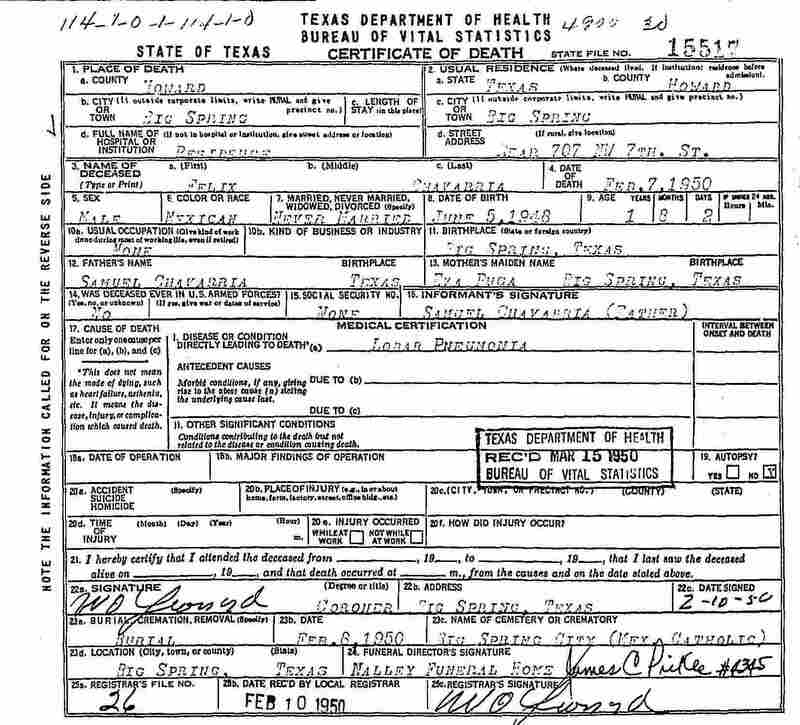 Brewster, Fisher, Howard, Pecos, Ward County death records. 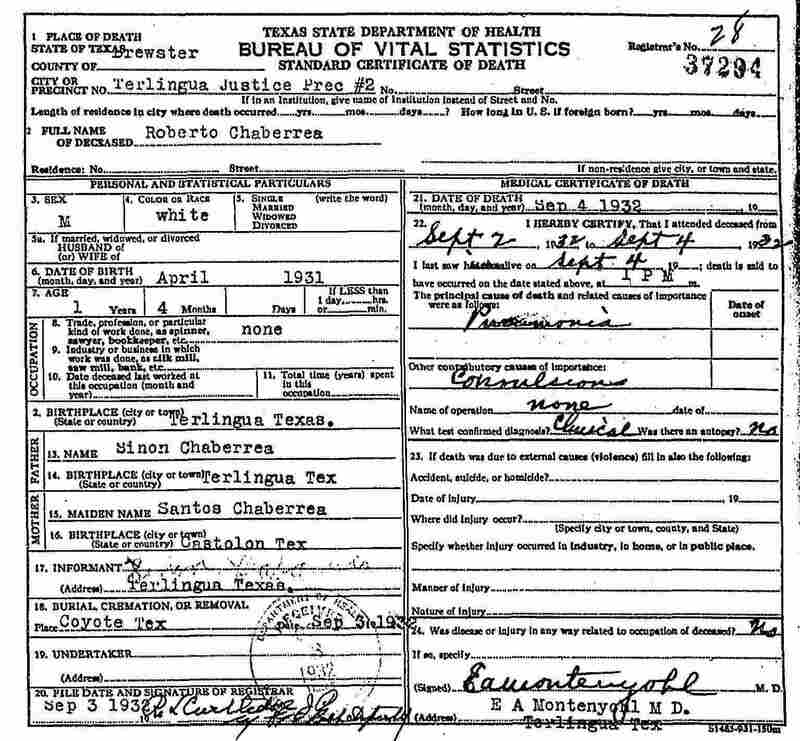 Brewster and Ector County marriage records. International Boundary Commission Irrigated Land Census, 1940. Newspaper article on Antolina Chavarria Rojo’s death, Alpine Avalanche, April 20, 1989, Archives of the Big Bend, Sul Ross State University, Alpine, Texas. Family history research by Maria Louisa Franco Madrid and Alicia Williams. Luis Ramirez obituary. May 2012, Nalley-Pickle & Welch Funeral Home web site. Cecilio Chavarria obituary, Alpine Avalanche, March 6, 1975, obituary files at Archives of the Big Bend, Sul Ross State University, Alpine. Texas. Geneva Chavarria obituary, Odessa American, February 23, 2011. Payroll records of the Study Butte Mining Company, W. Keesey Collection, Archives of the Big Bend, Sul Ross State University, Alpine, Texas. Gregorio Y. Chavarria obituary, Fort Stockton Pioneer, January 20, 2005. Mauricia Garcia obituary, Odessa American, November 28, 2002. Juliana C. Heredia obituary, Odessa American, July 24, 2004. Gabriel Chavarria obituary, Alpine Avalanche, July 26, 2007. 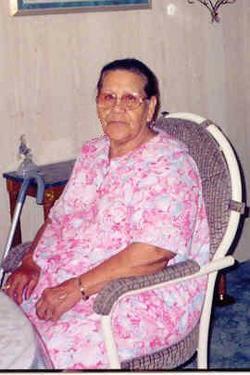 Concepcion “Concha” Vasquez obituary, Fort Stockton Pioneer, July 1, 2004. Juliana “Julia” Carrasco obituary, Fort Stockton Pioneer, December 2008. Albert “Beto” Chavarria obituary, Big Spring Herald, February 3, 2012. 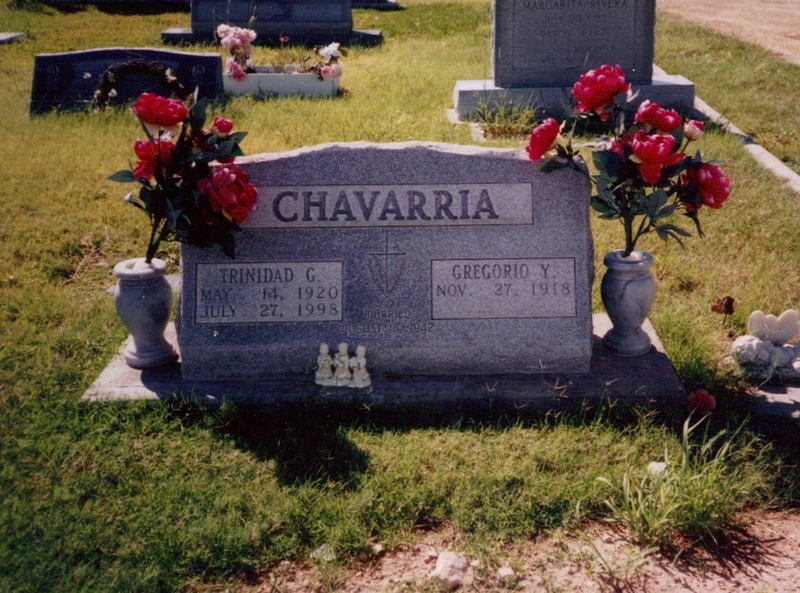 Samuel Galindo Chavarria obituary, Texas USGenWeb Archives Project, Ector County. Louis Ramirez obituary, Nalley-Pickle & Welch Funeral Home, Big Spring, Texas web site. Trinidad Chavarria obituary, unknown newspaper, July 1998. Catalina Chavarria obituary, Alpine Avalanche, August 28, 2008. Simona Chavarria Jimenez obituary, Family Services Funeral Parlor, Kermit, Texas web site. Rev. 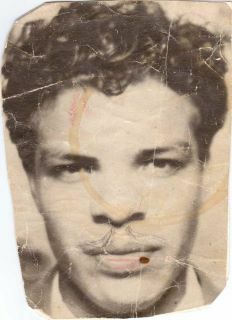 Ismael Bihl, Sr. obituary, Find A Grave web site. Copyright 2012 by Bob Wirt; all rights reserved.